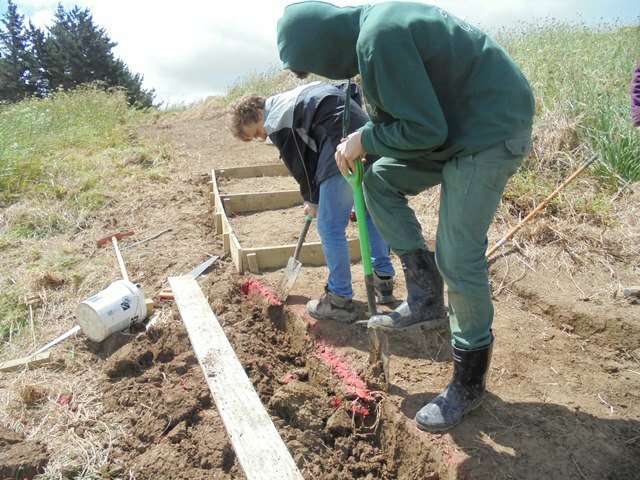 In addition to roads to provide access to the property, we are also putting in walking tracks so that visitors will be able to enjoy exploring the CUE Haven forest. 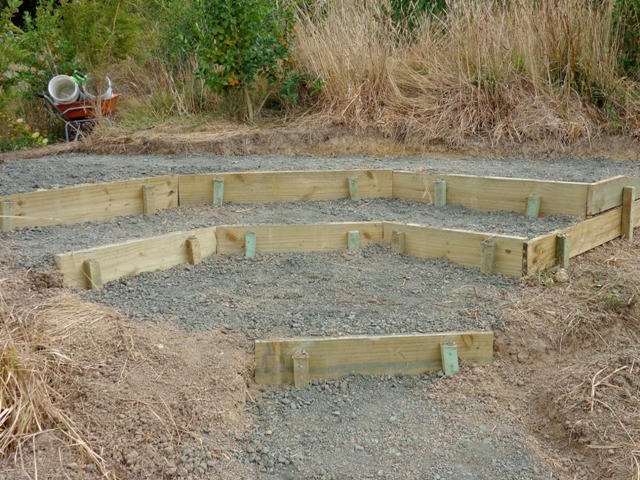 We are laying out the tracks now so that we won’t have to disturb the bush later on. 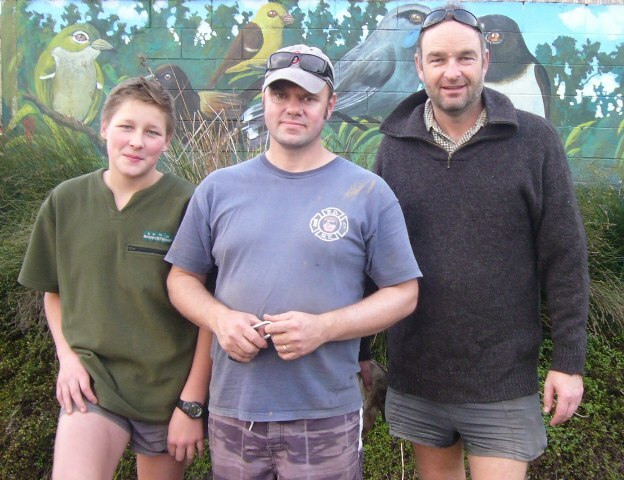 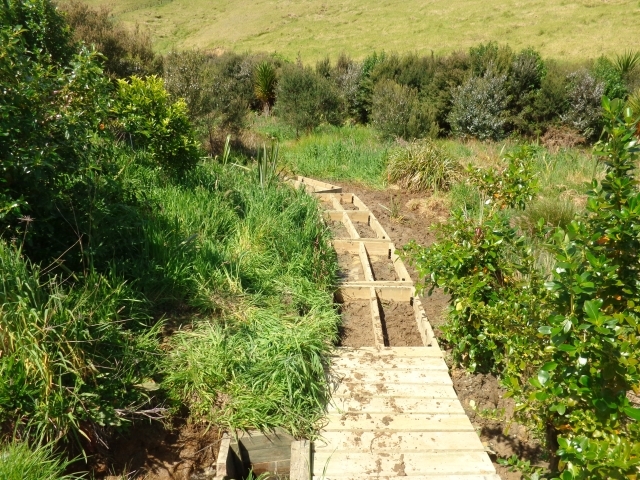 Our first tracks were put in through the wetlands in February 2011 and in October 2011 we started a more extensive track through the mature bush along the gully stream. 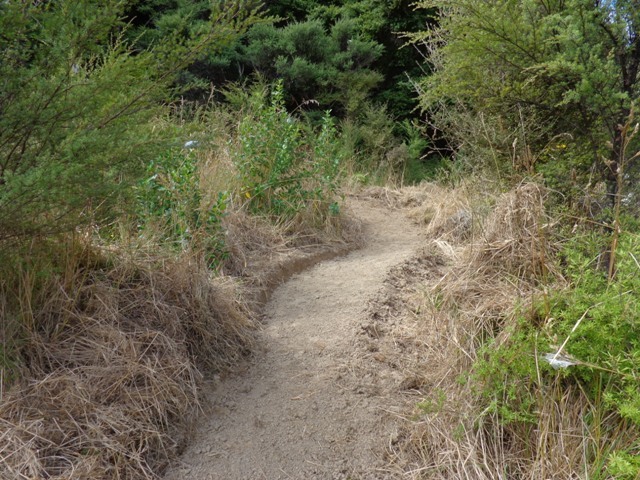 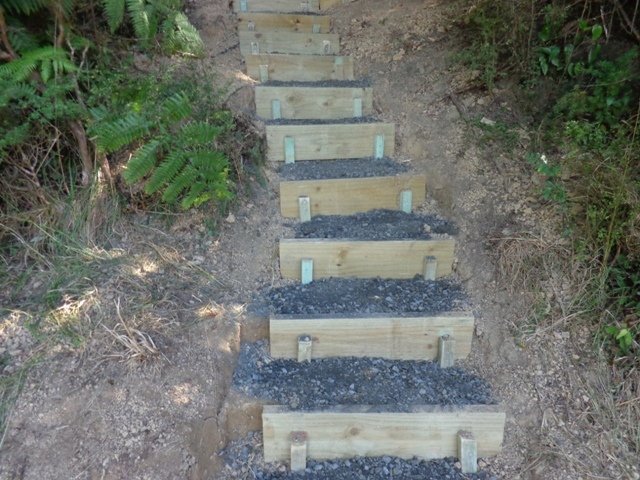 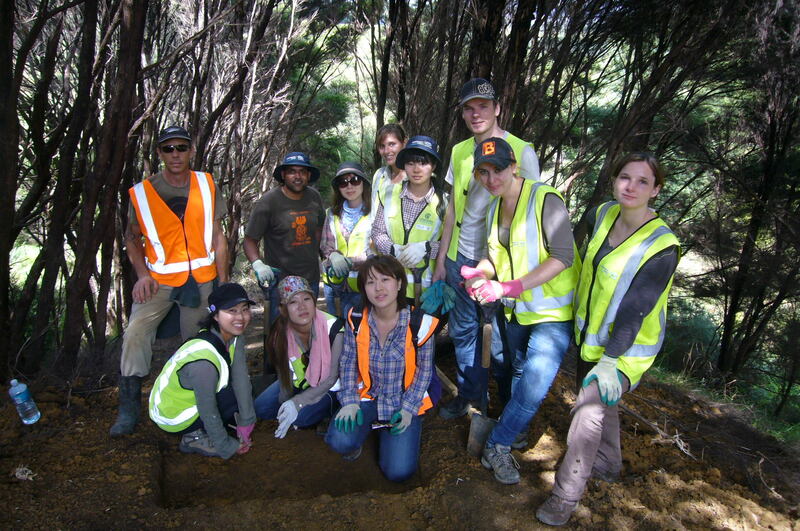 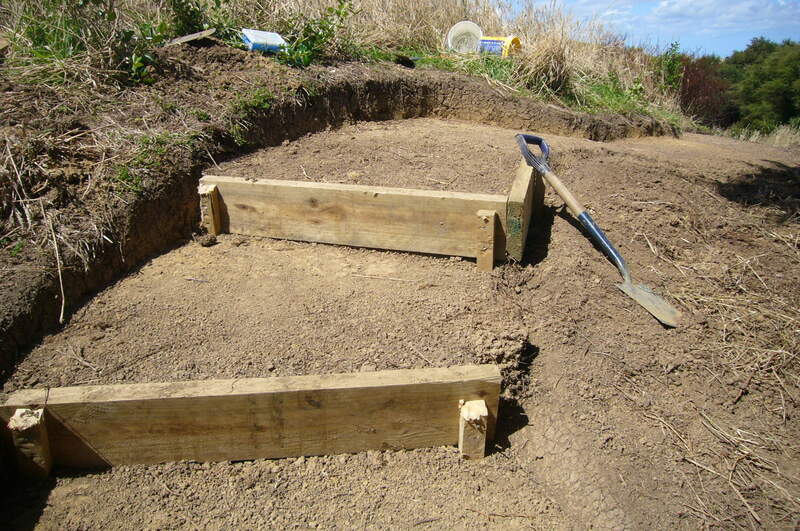 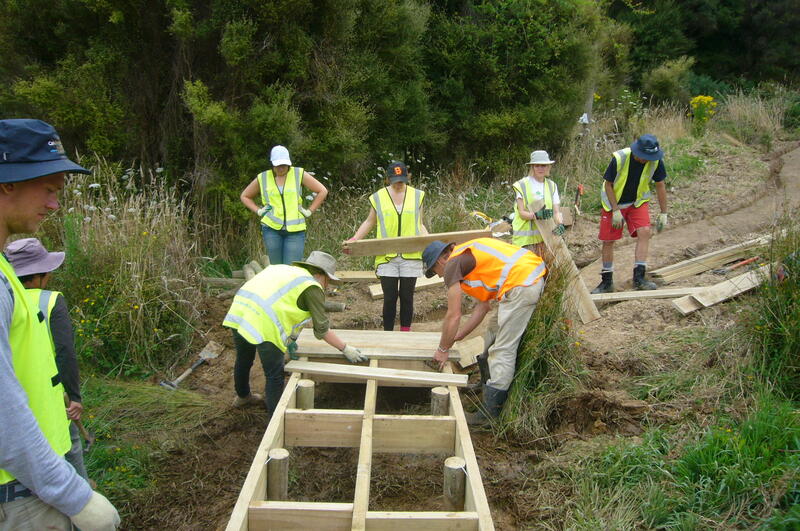 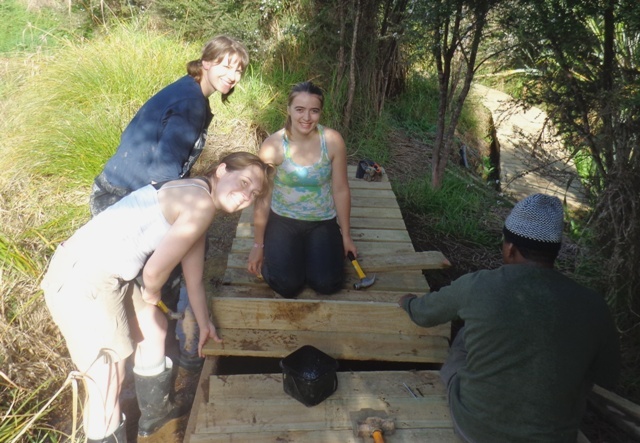 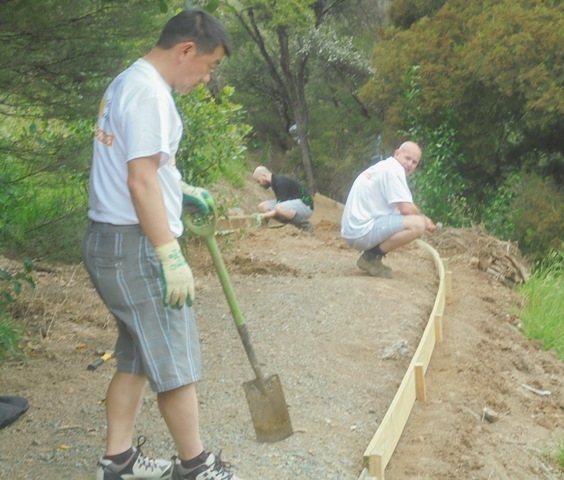 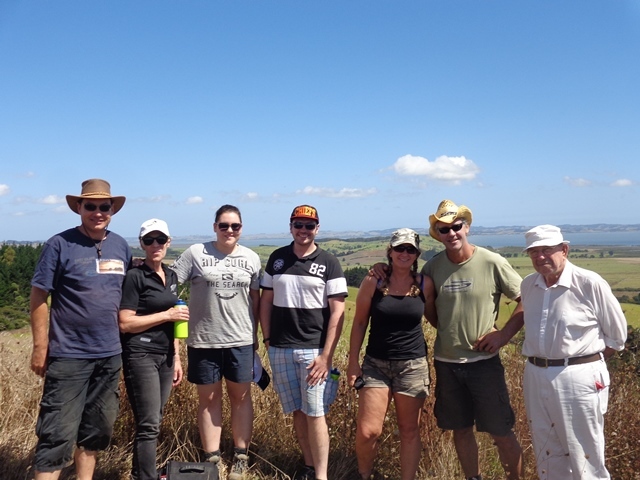 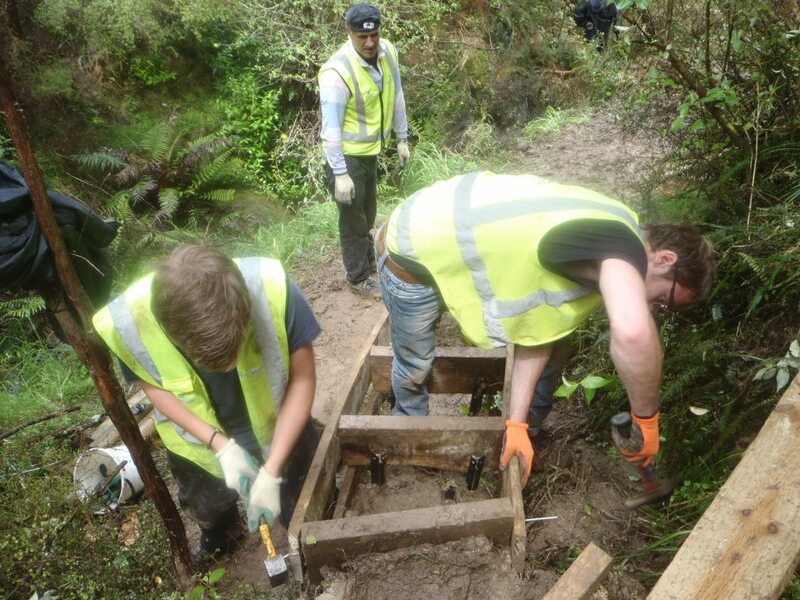 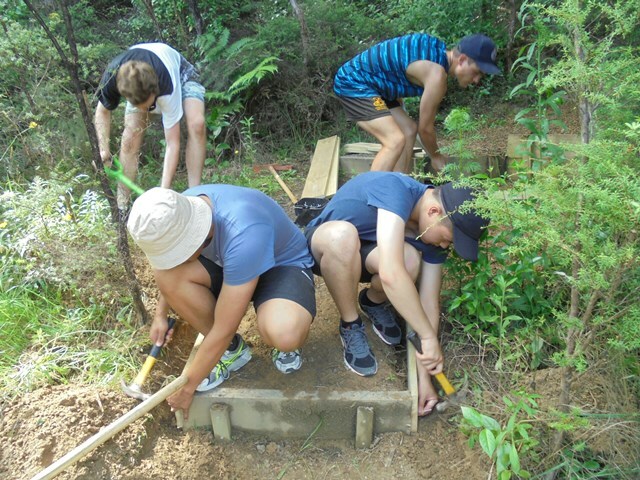 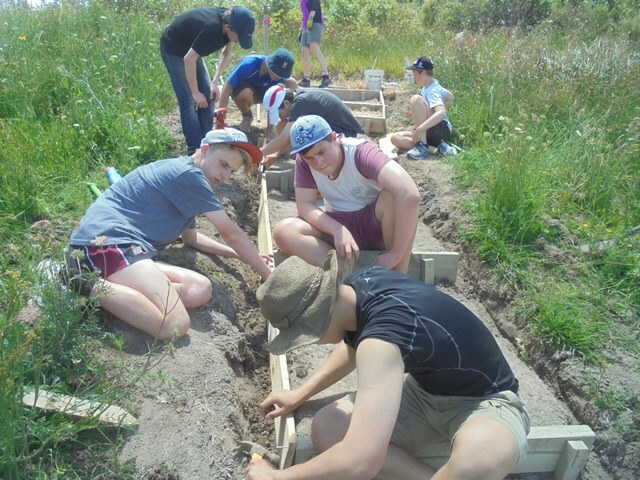 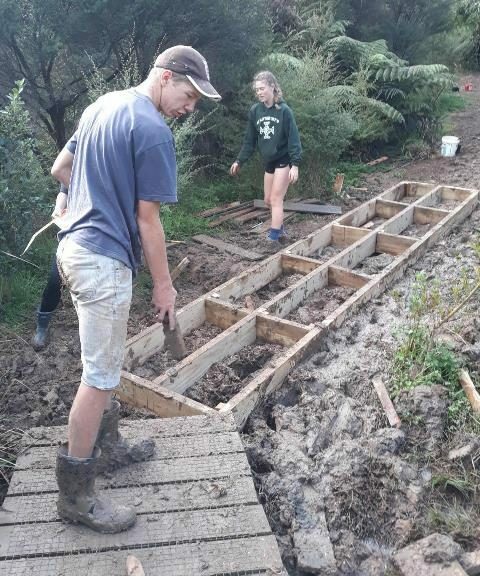 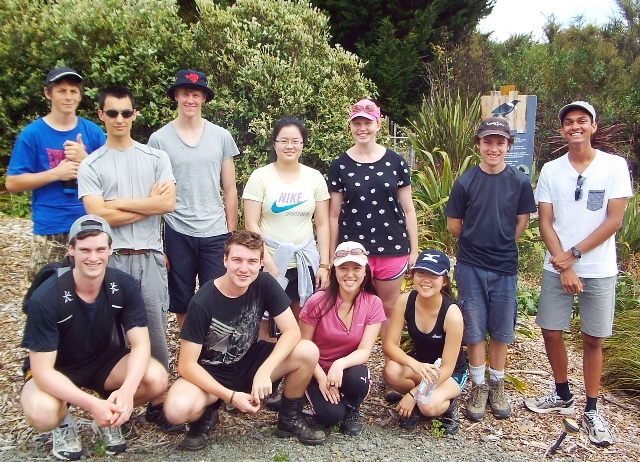 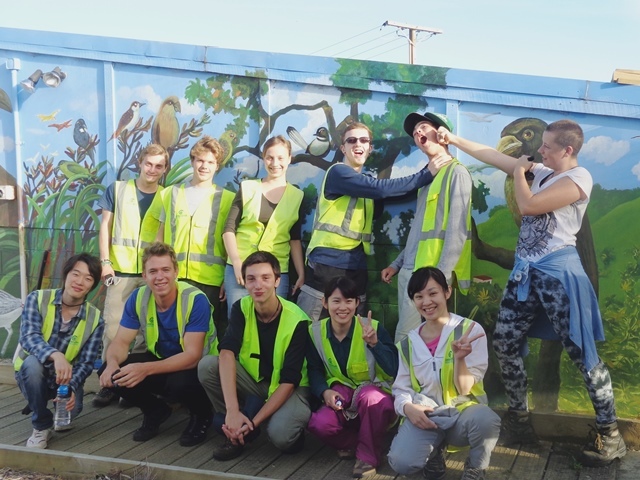 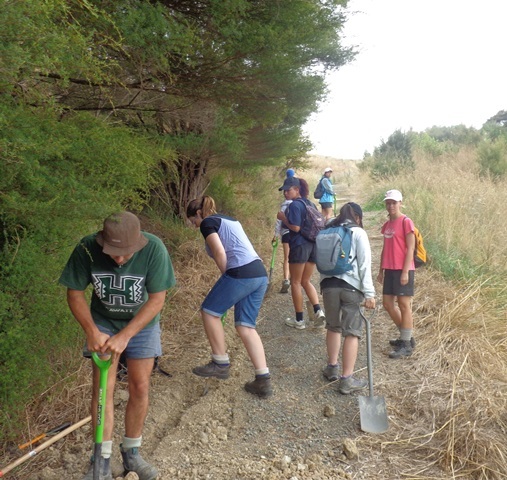 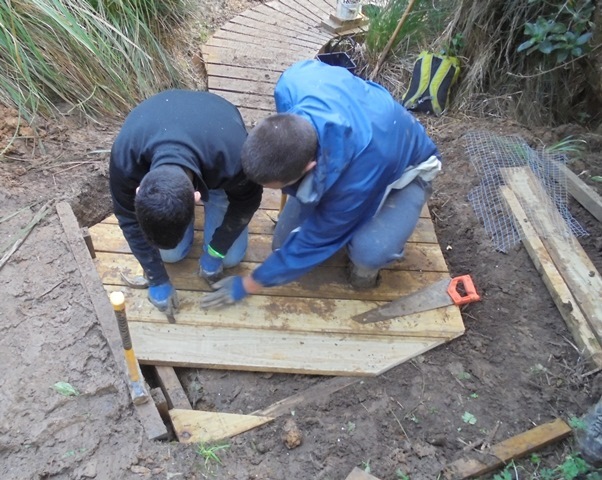 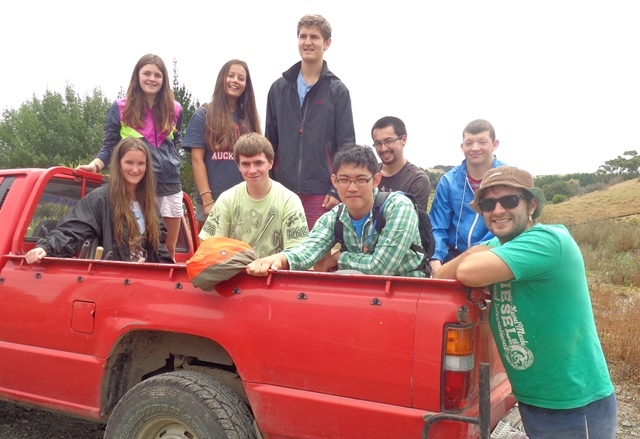 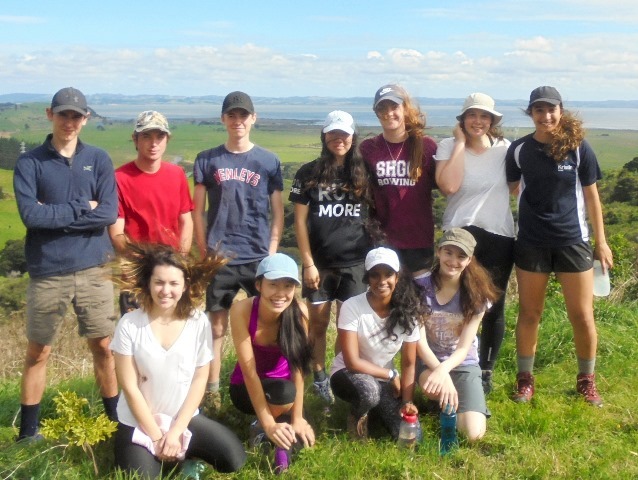 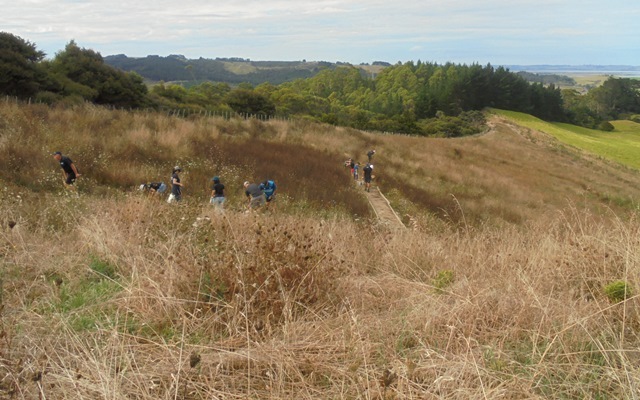 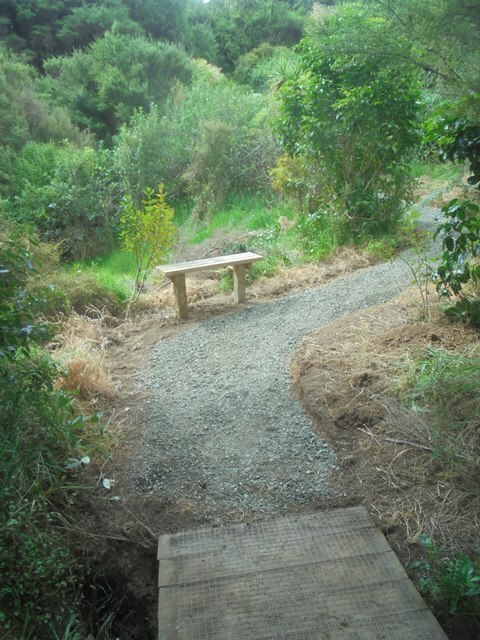 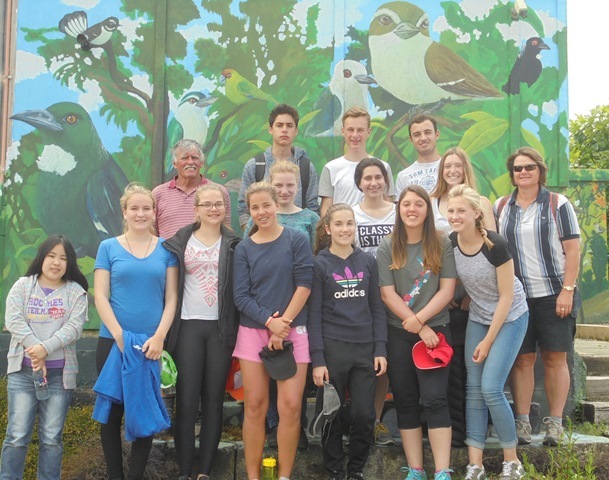 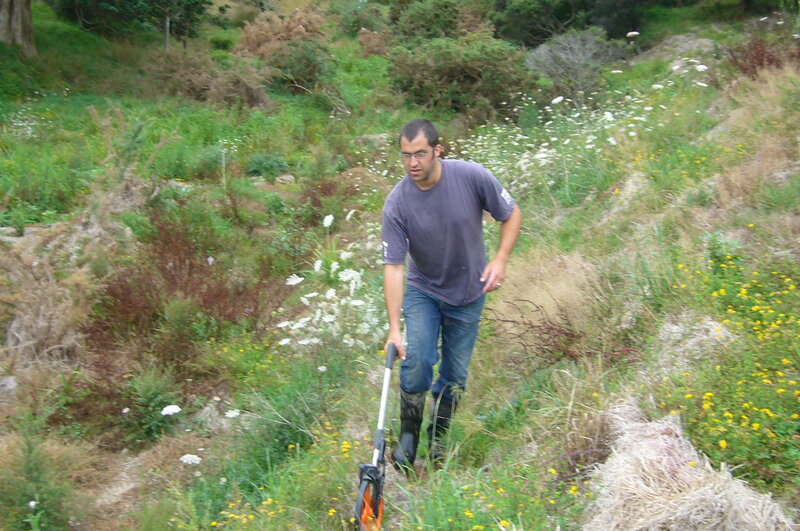 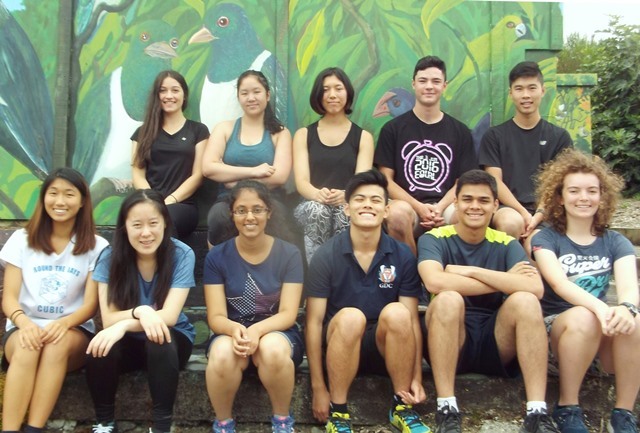 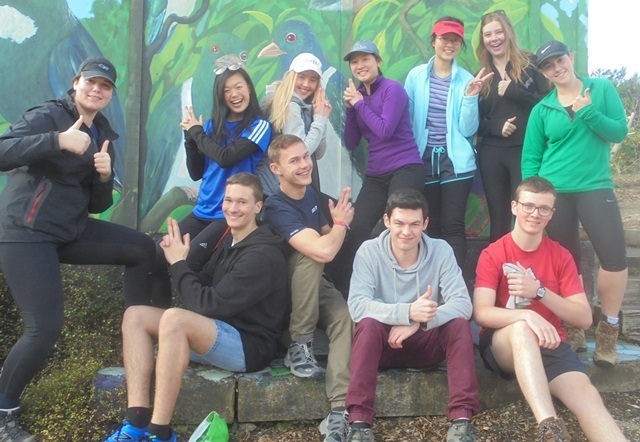 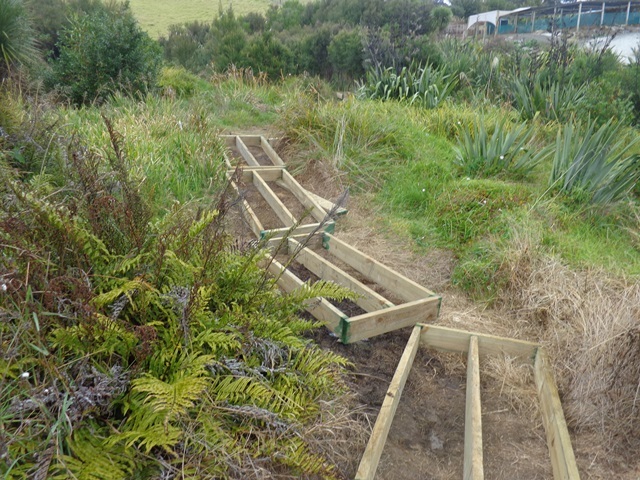 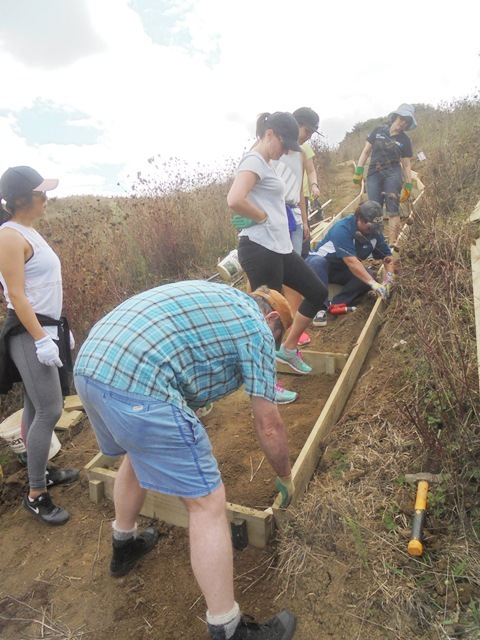 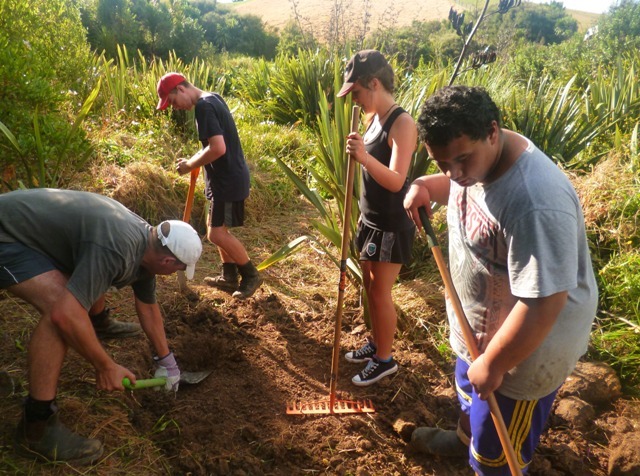 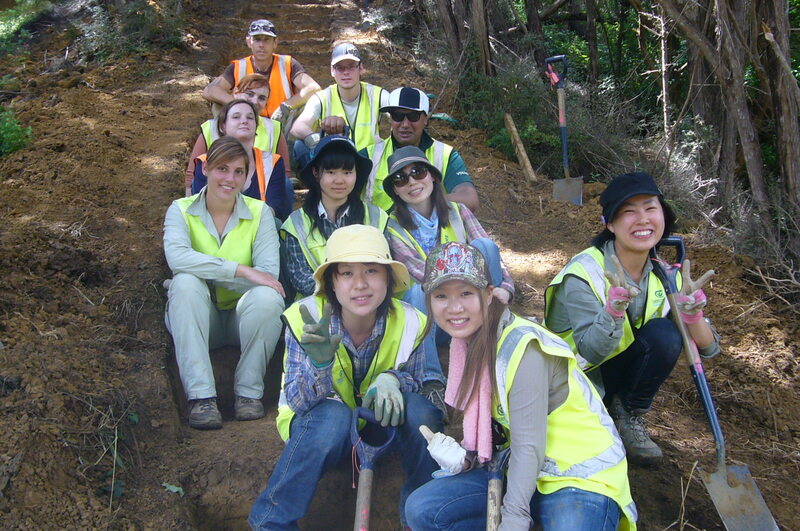 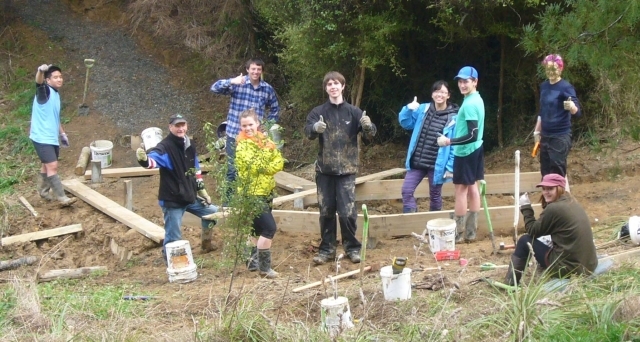 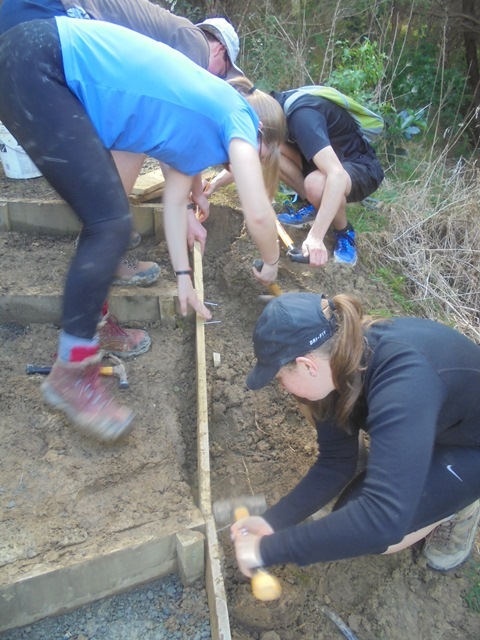 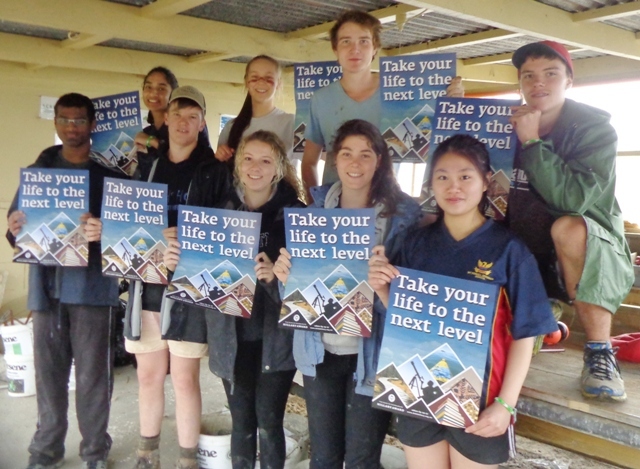 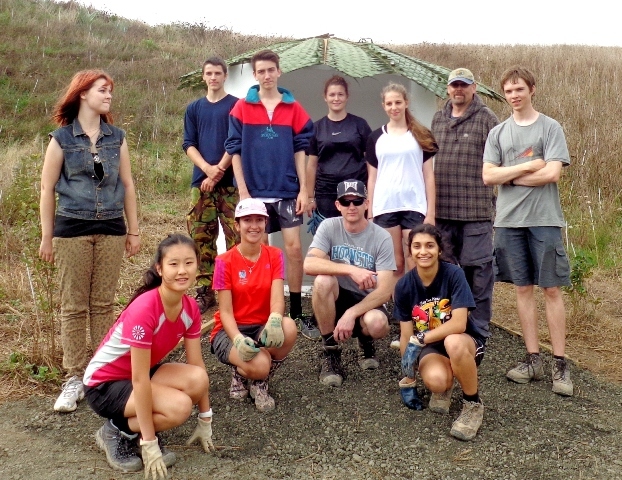 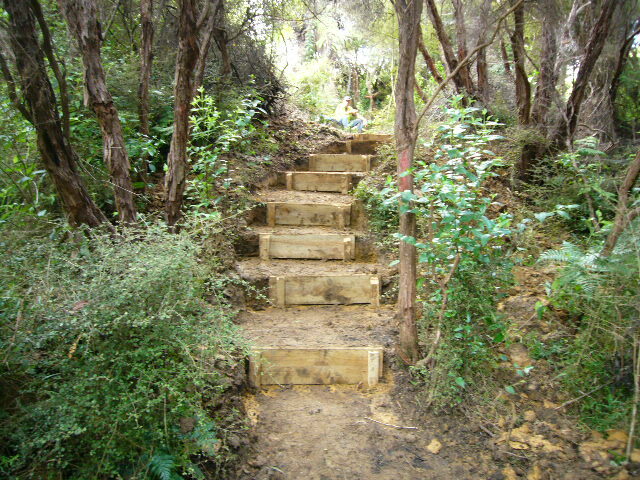 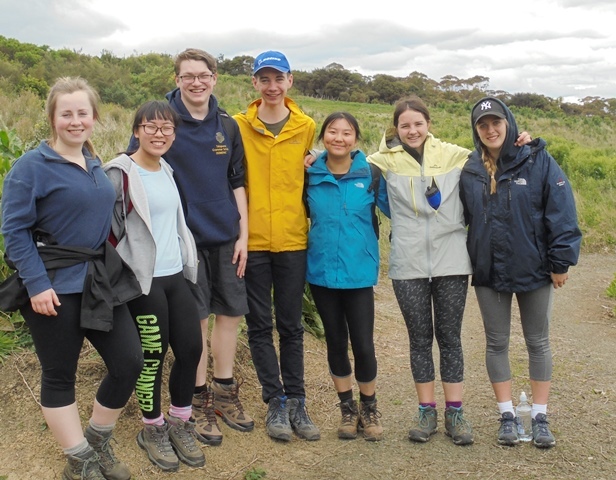 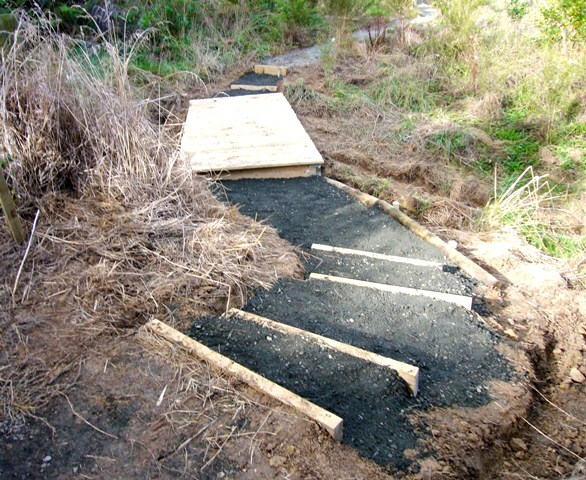 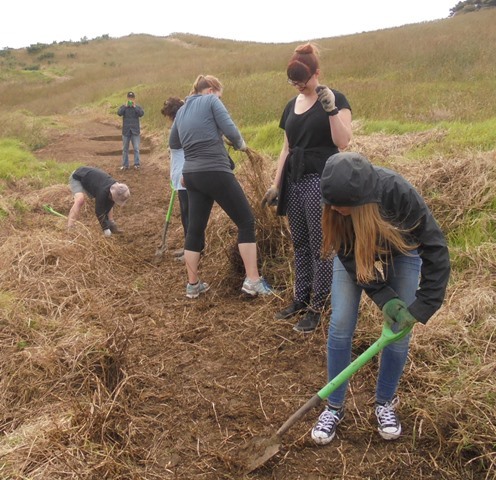 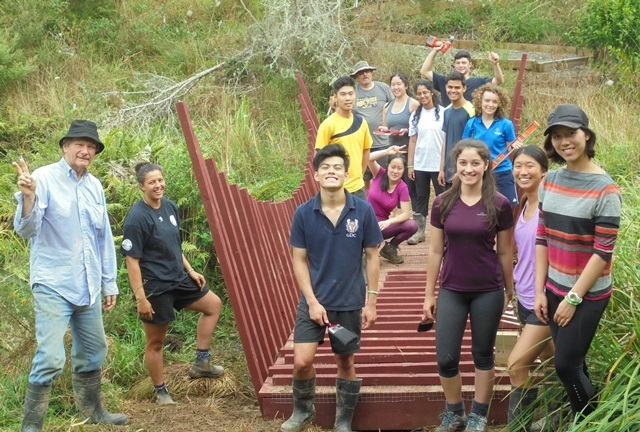 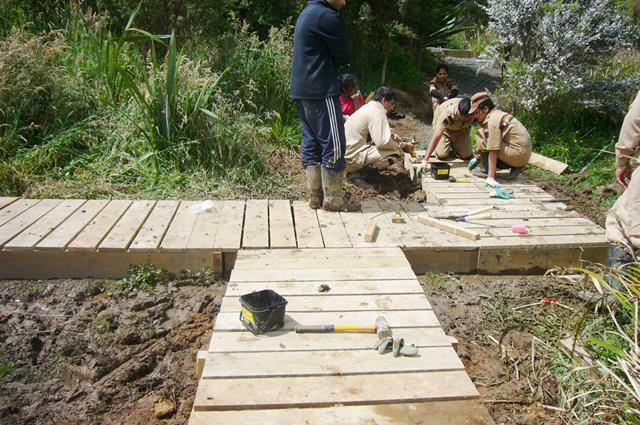 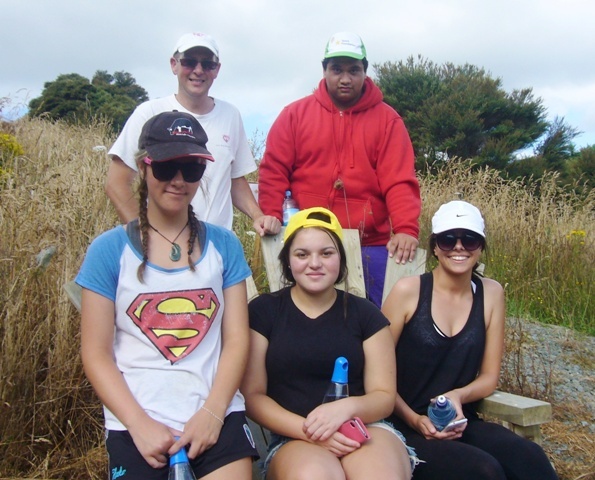 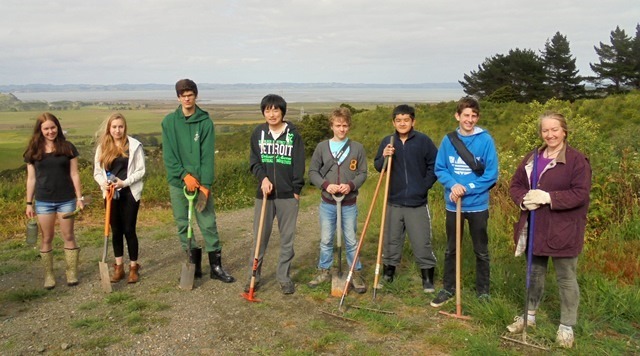 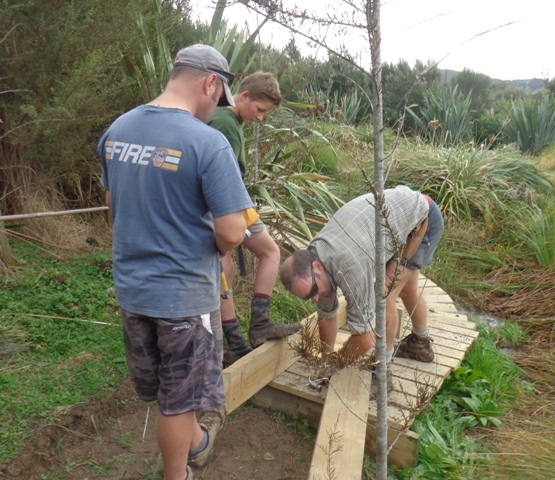 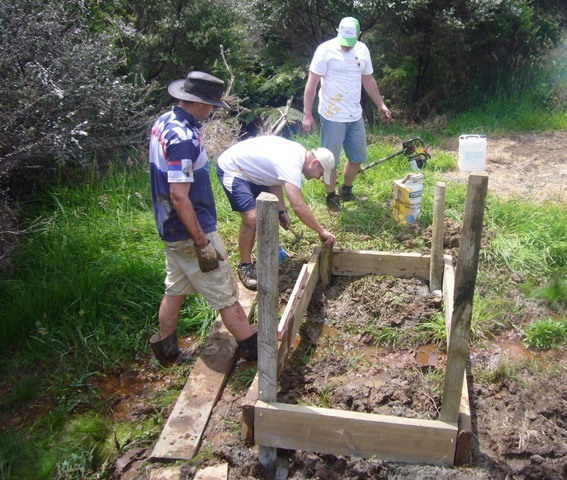 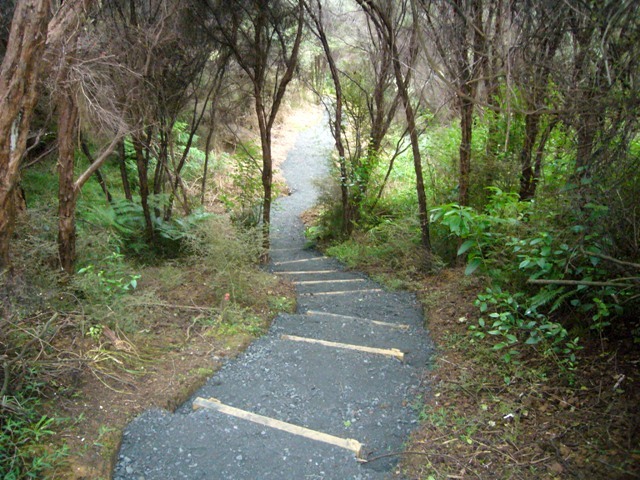 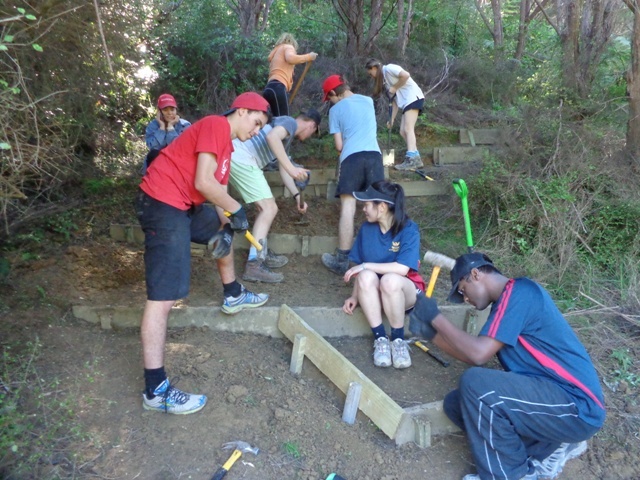 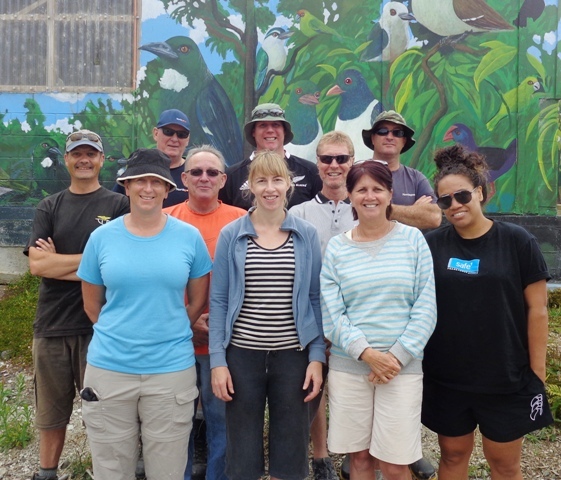 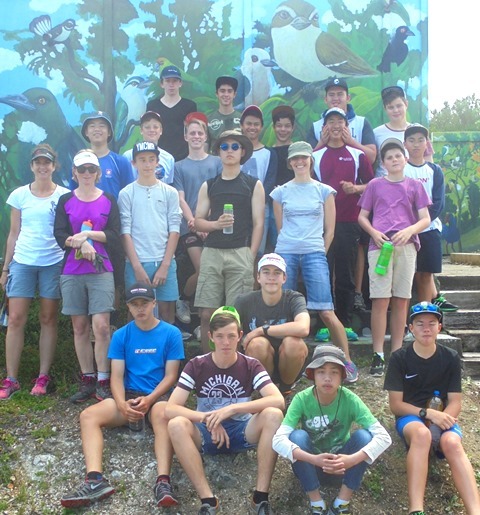 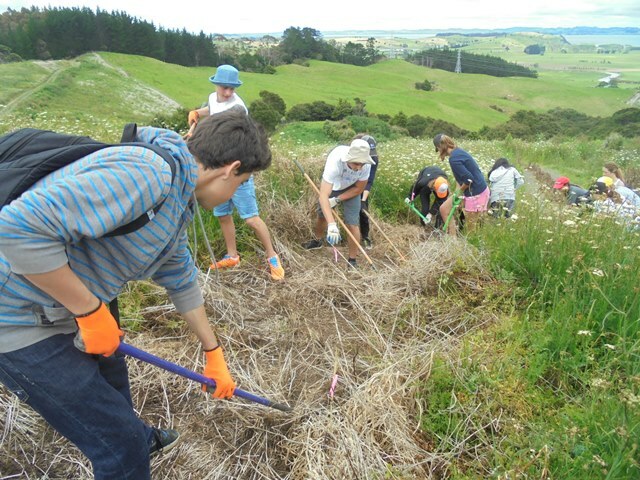 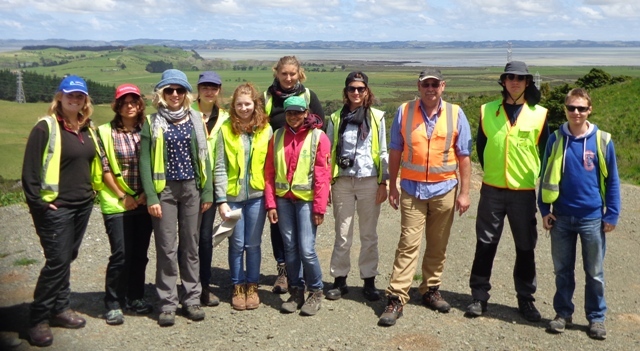 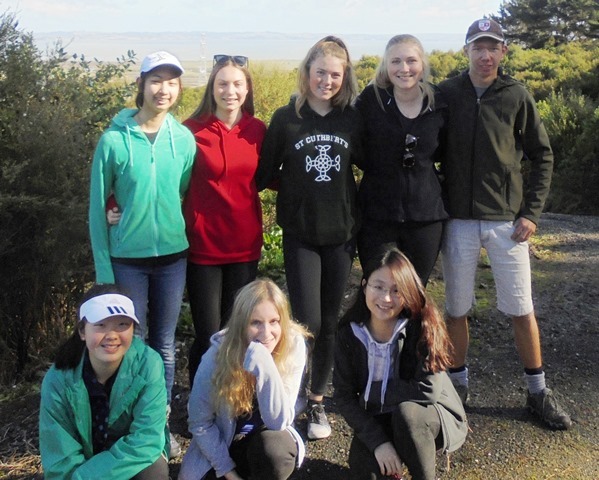 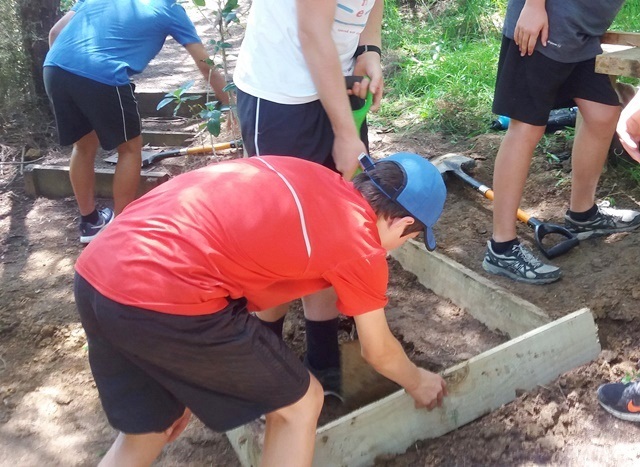 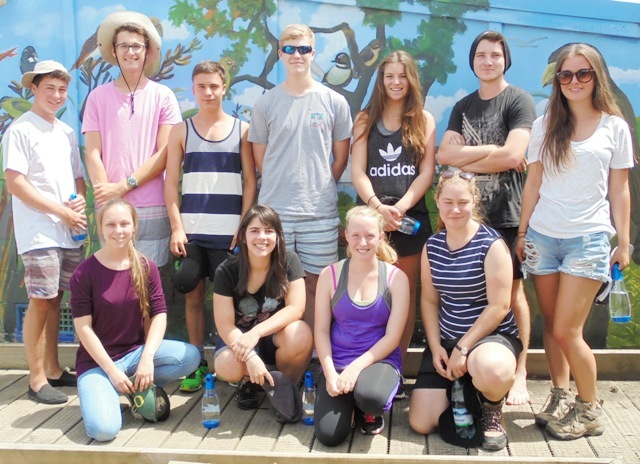 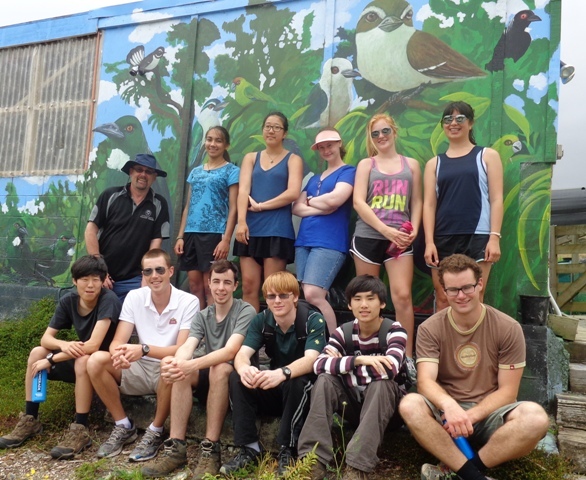 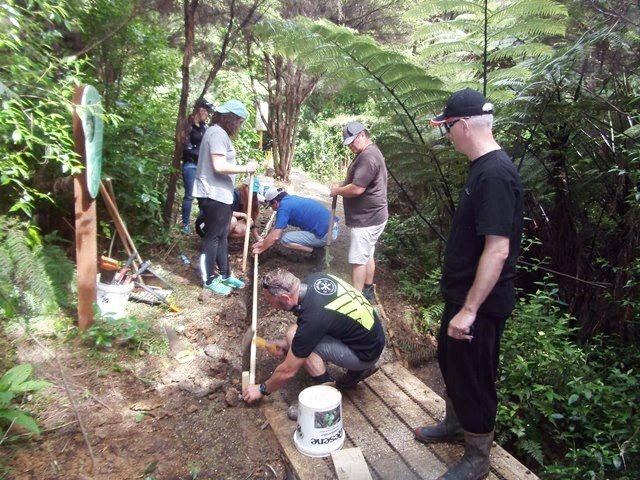 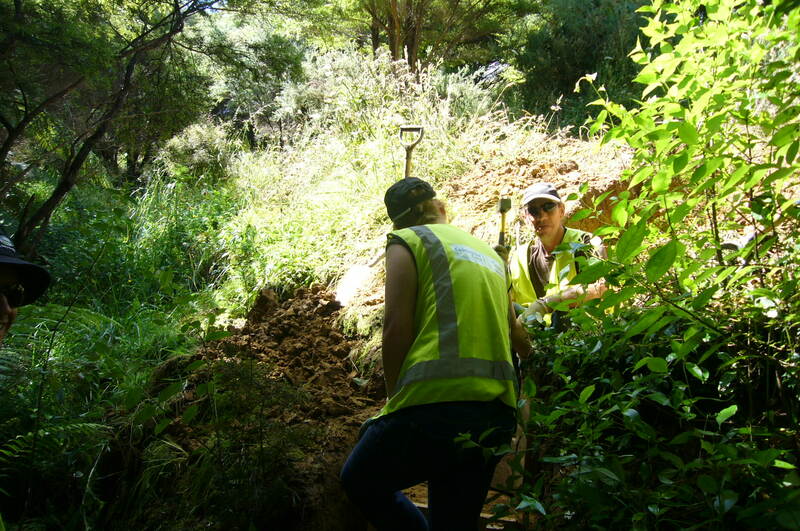 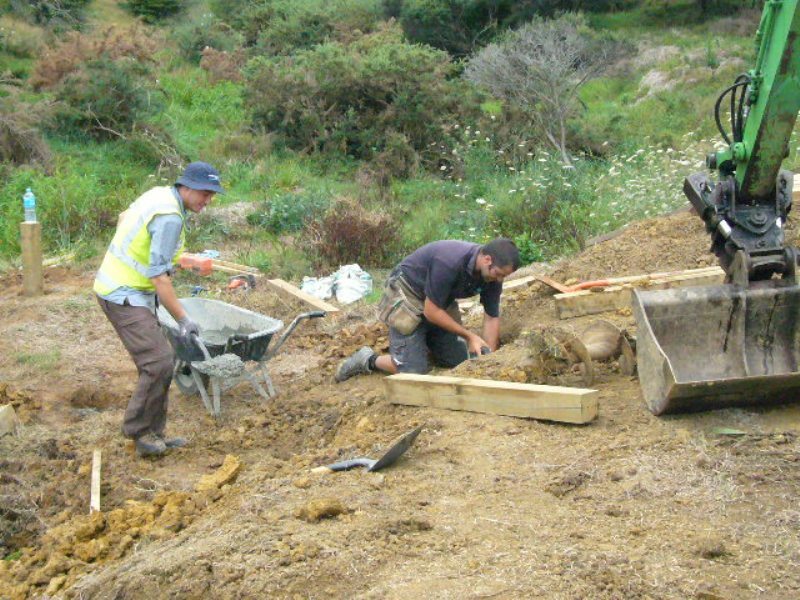 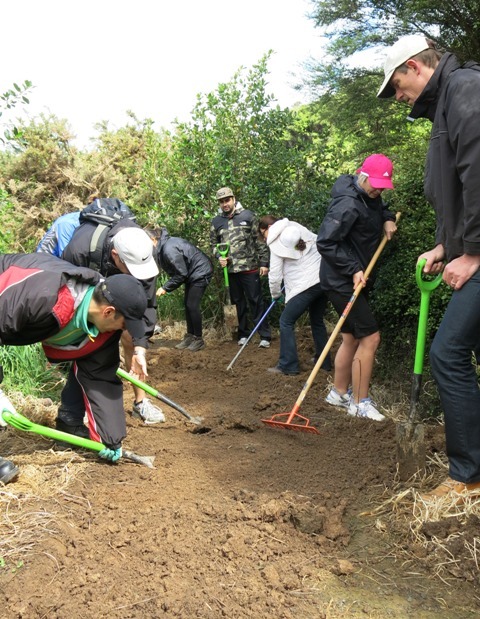 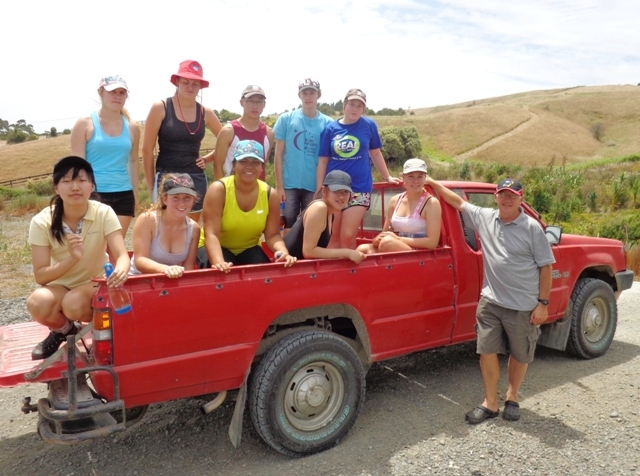 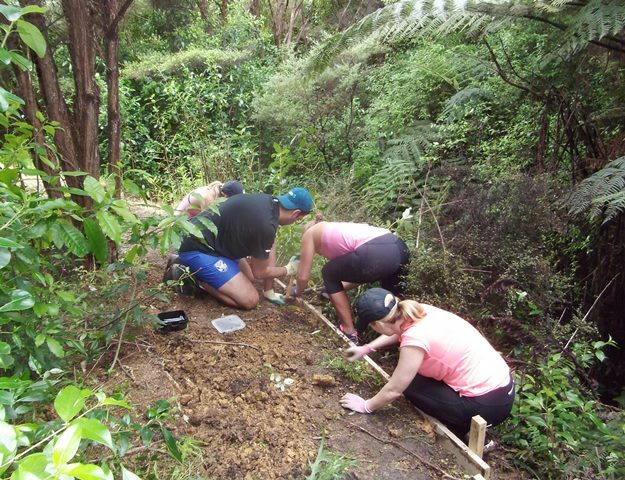 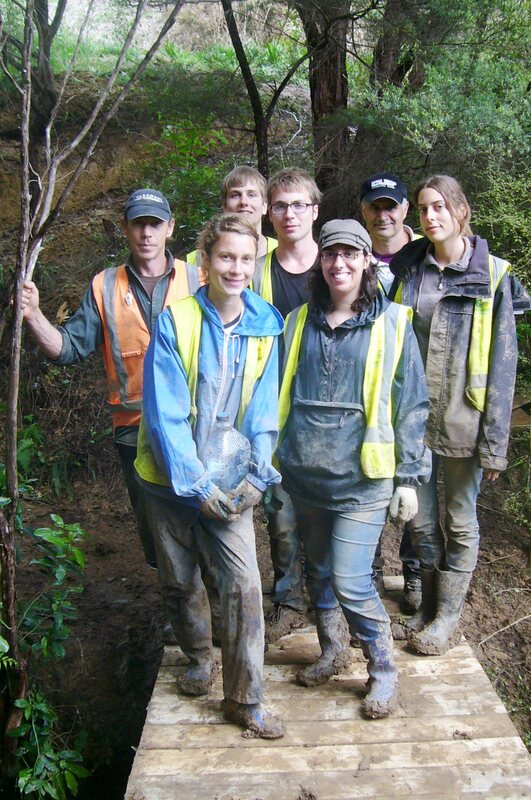 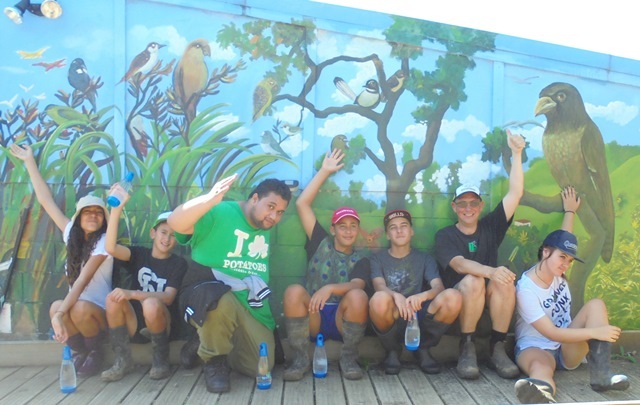 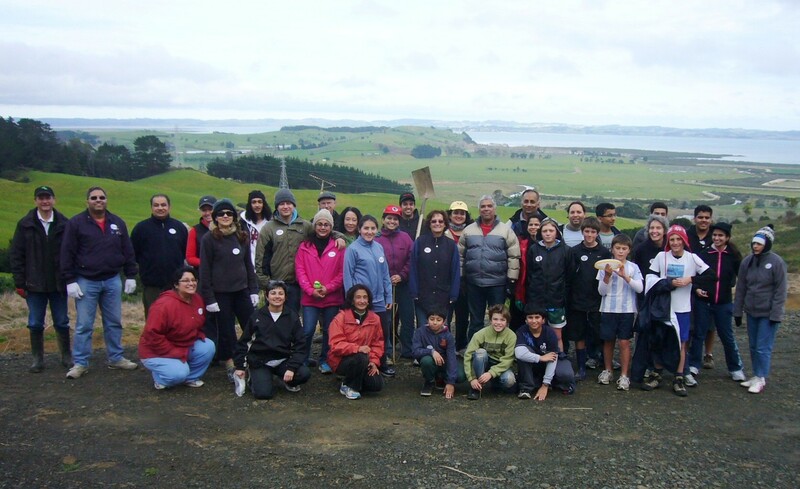 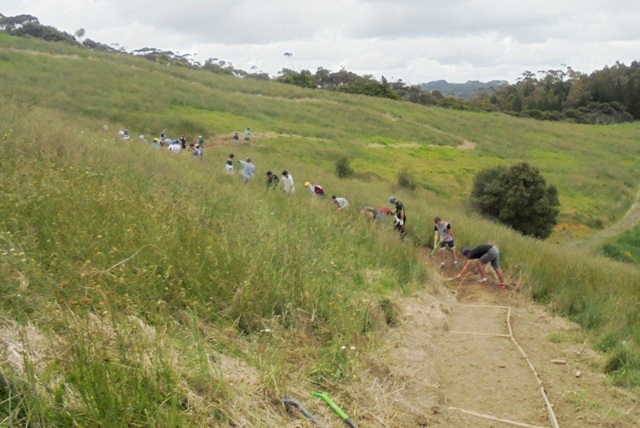 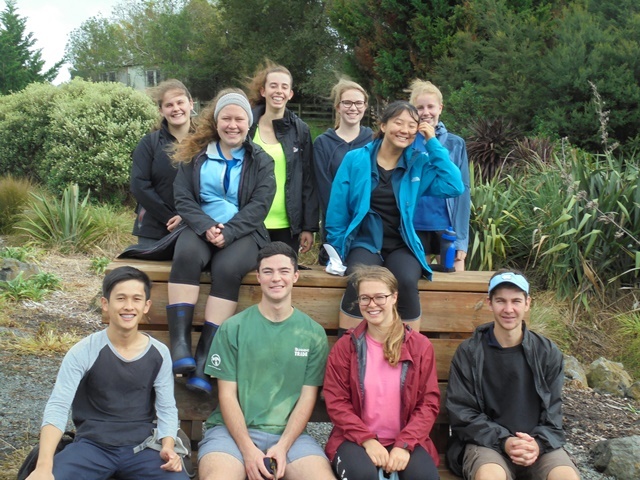 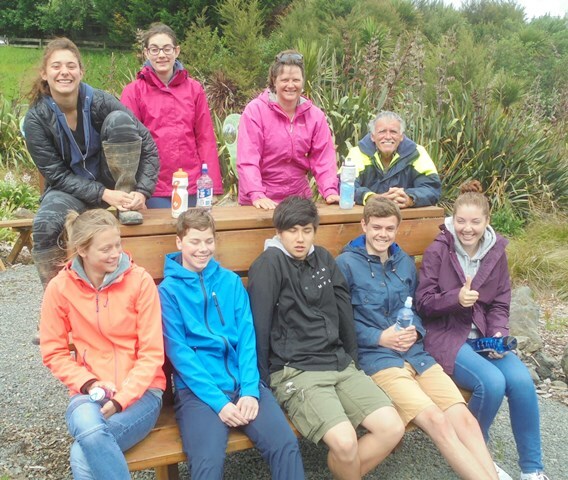 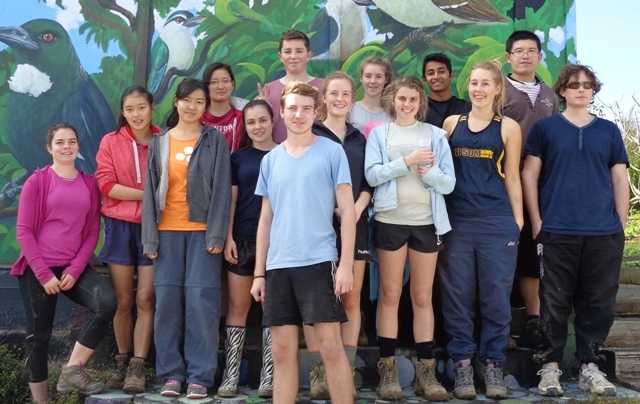 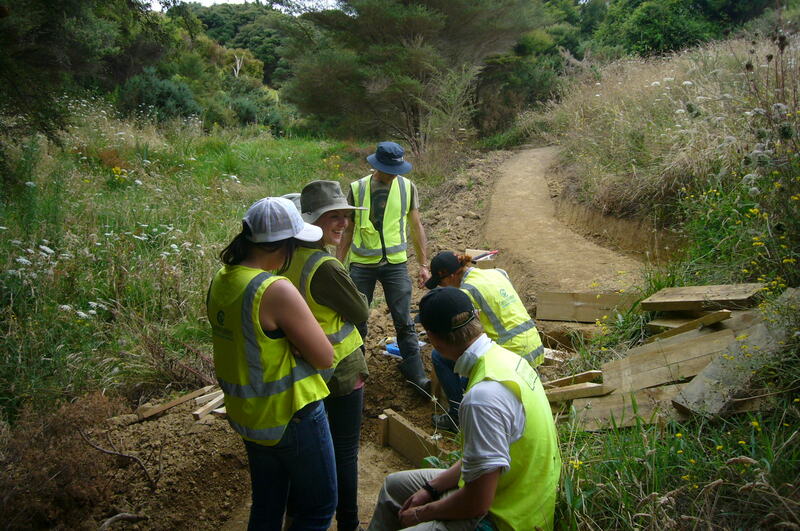 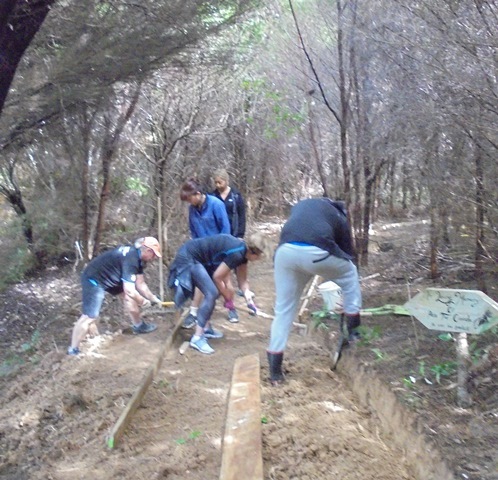 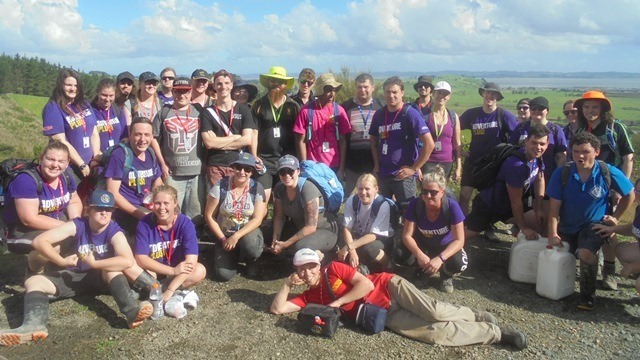 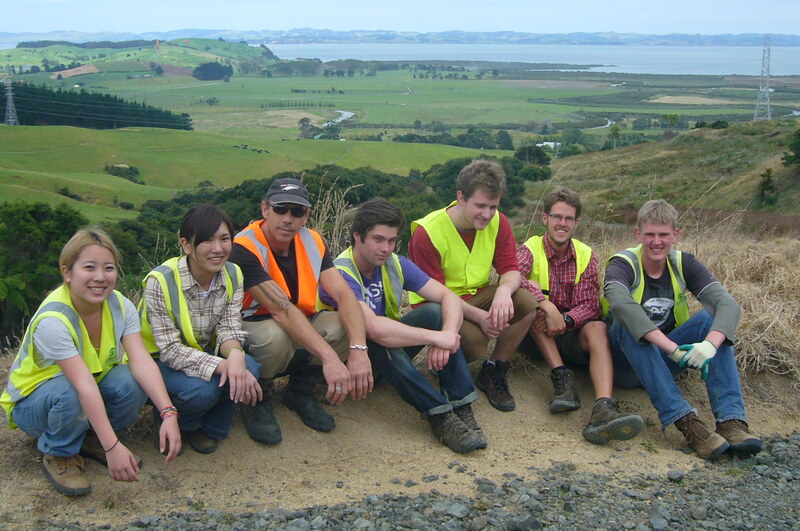 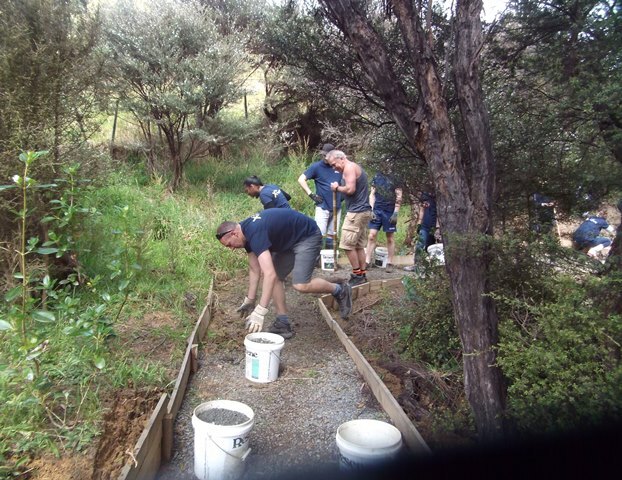 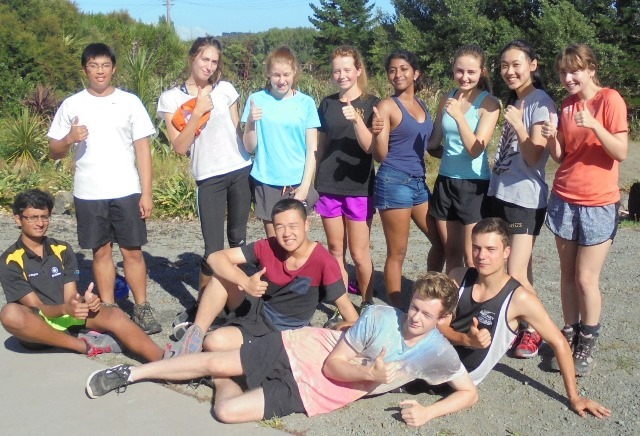 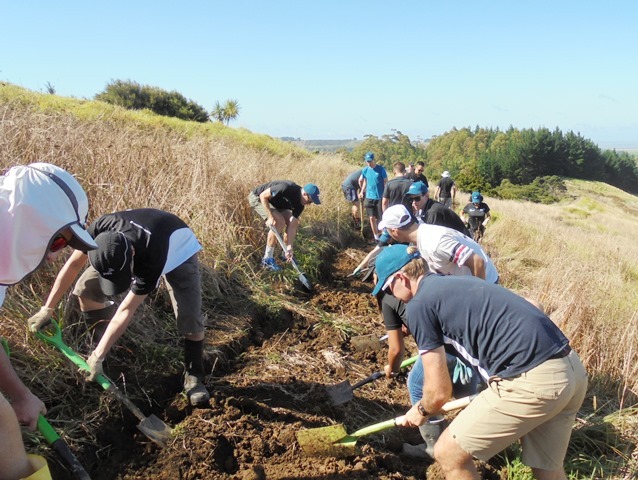 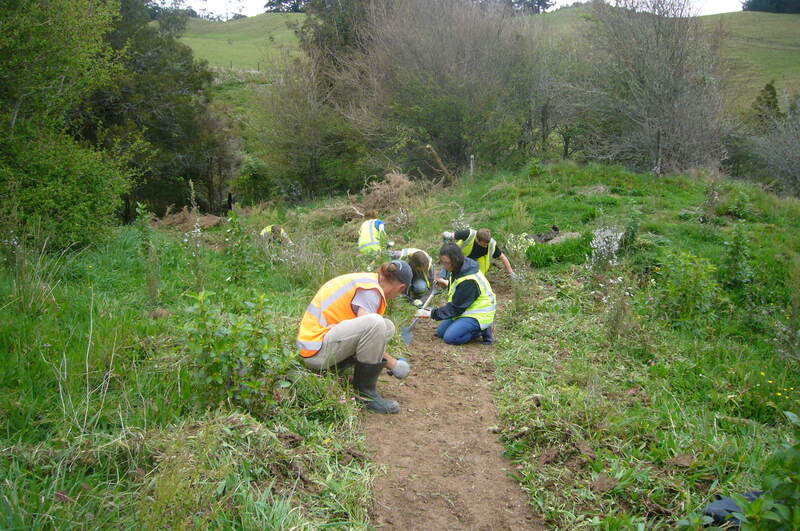 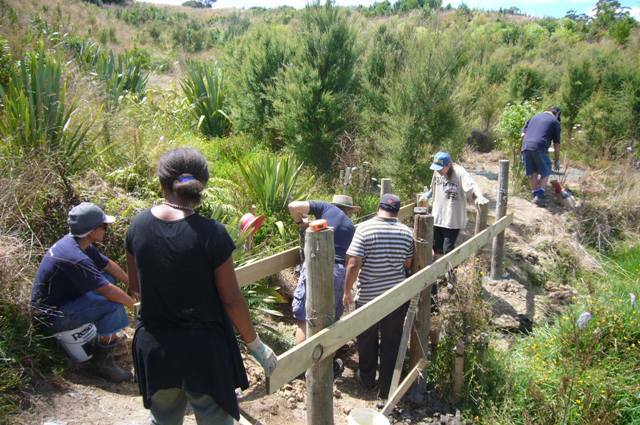 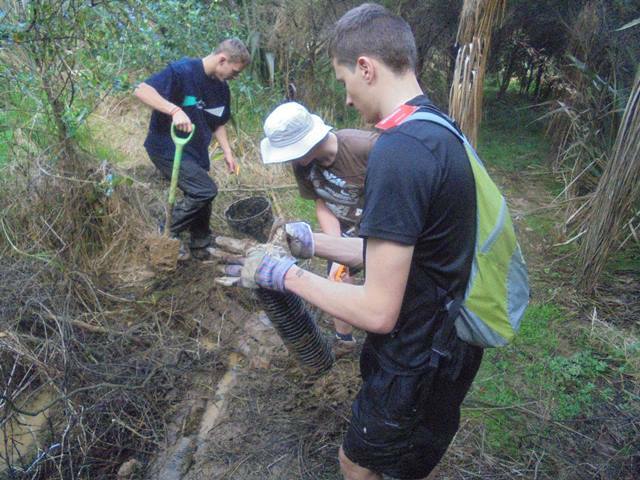 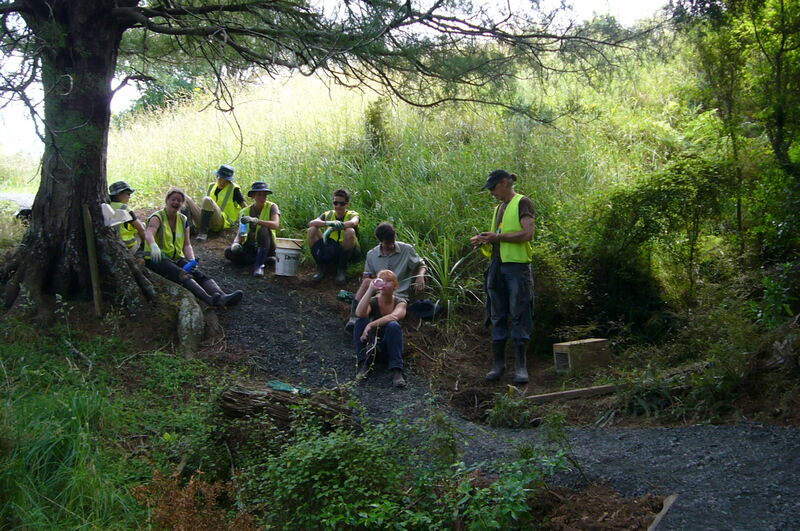 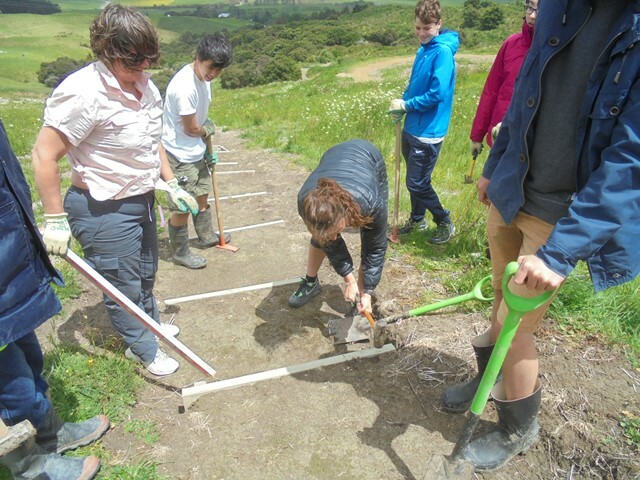 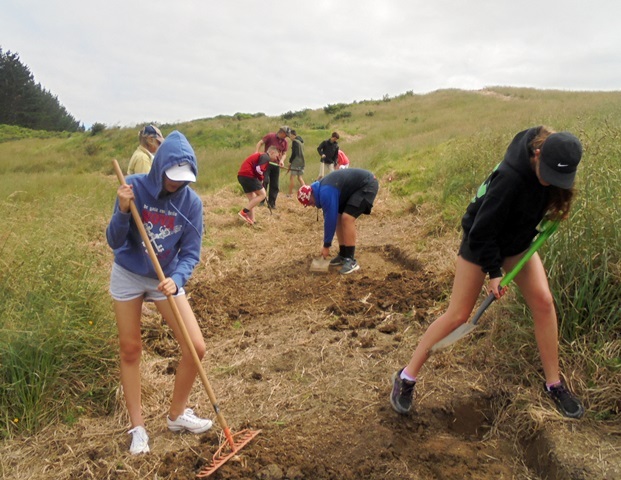 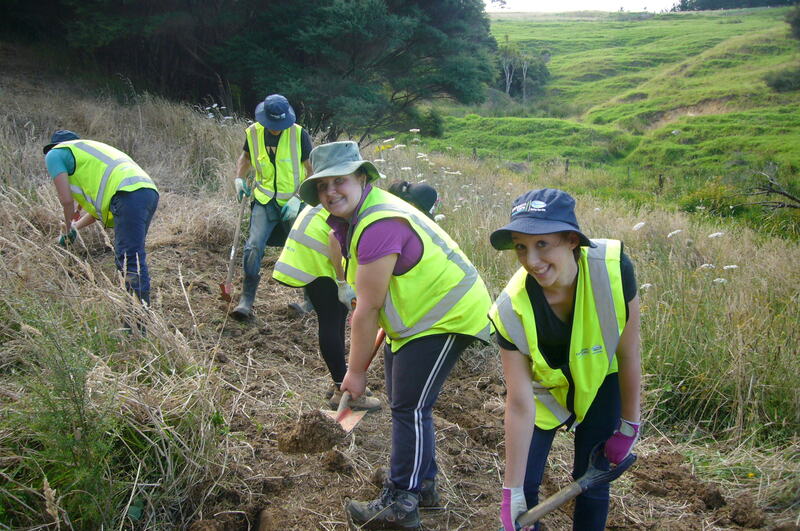 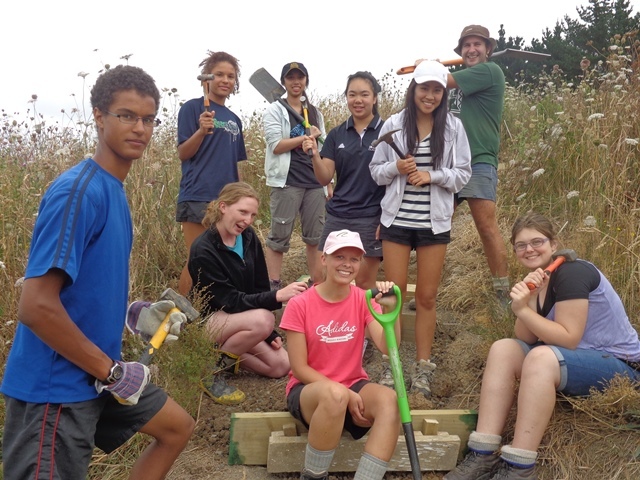 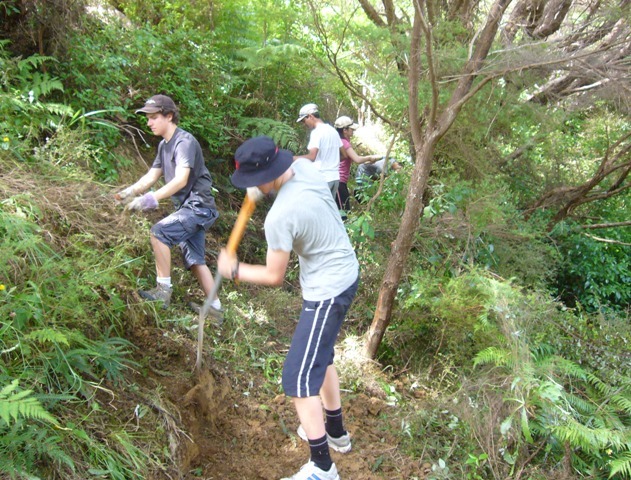 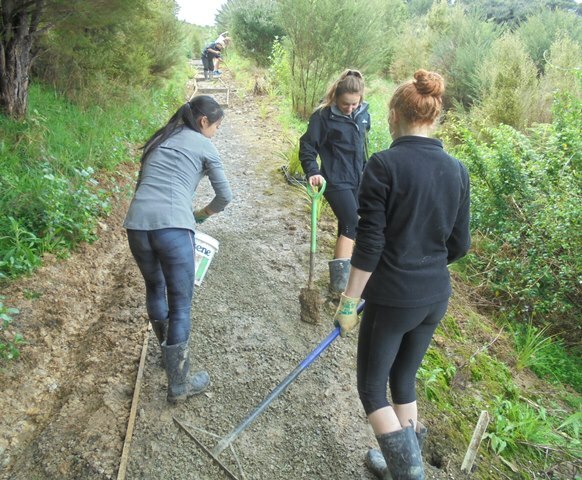 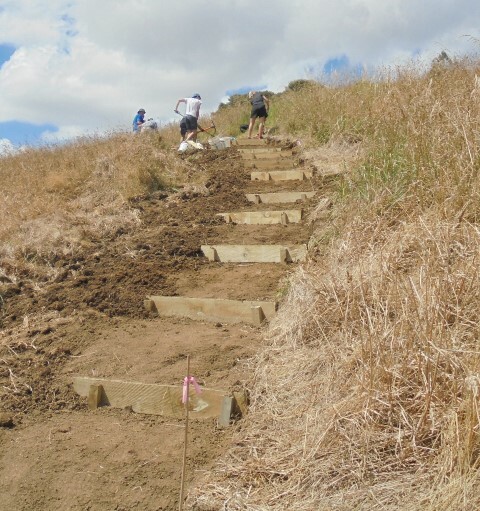 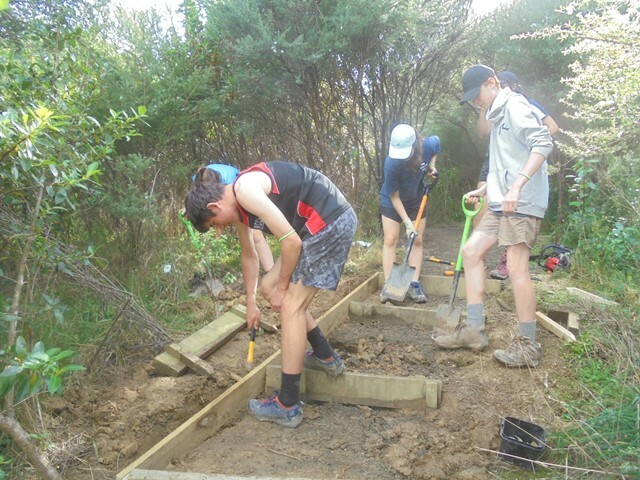 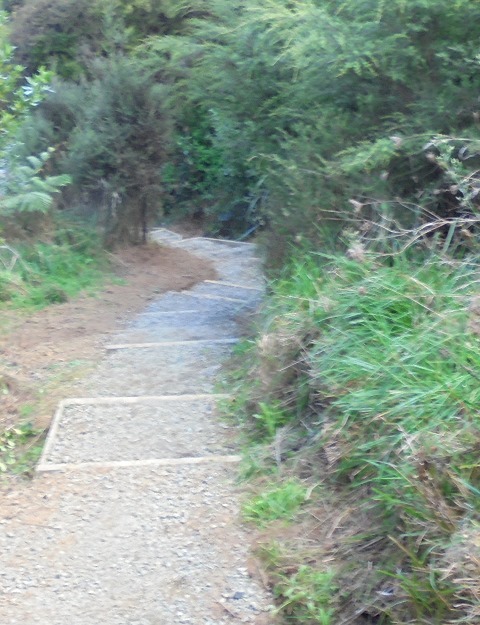 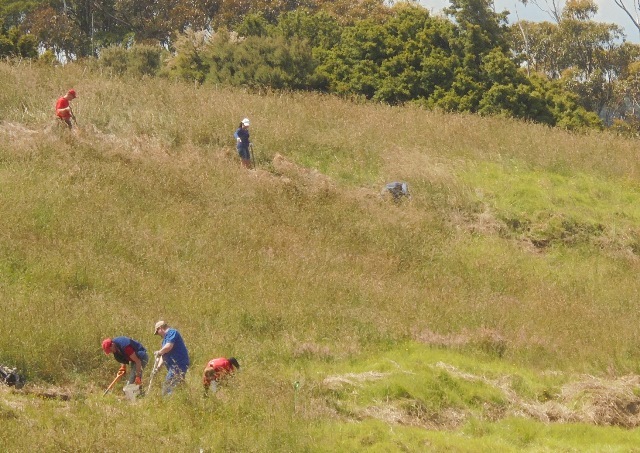 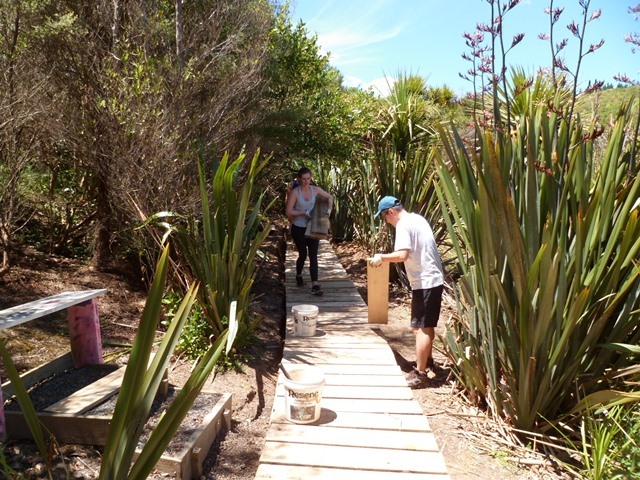 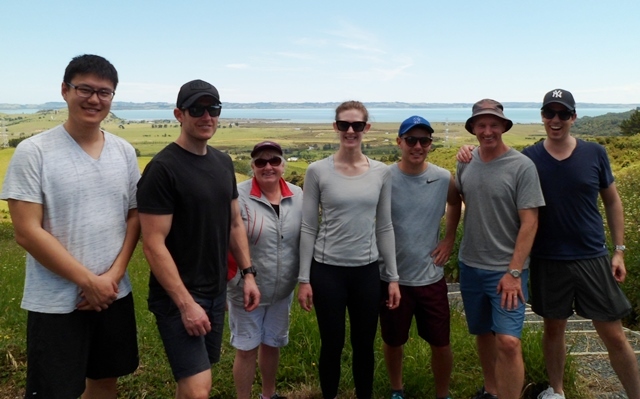 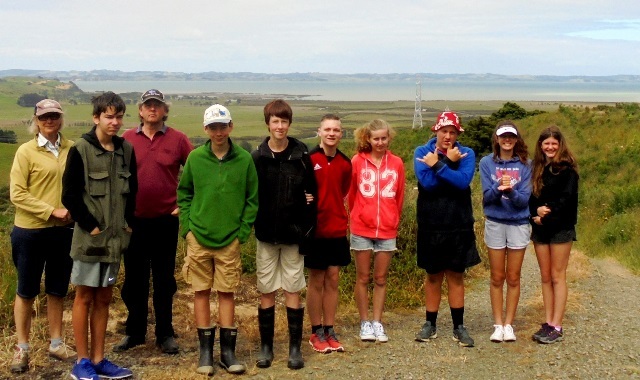 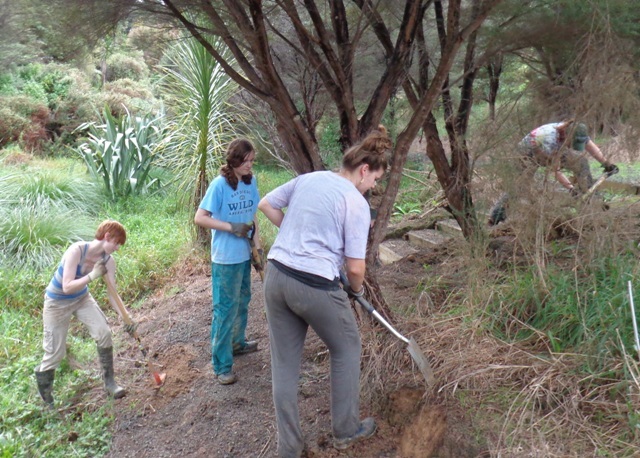 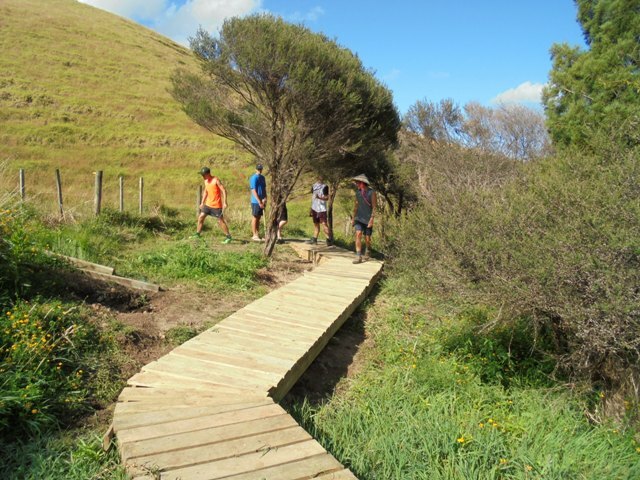 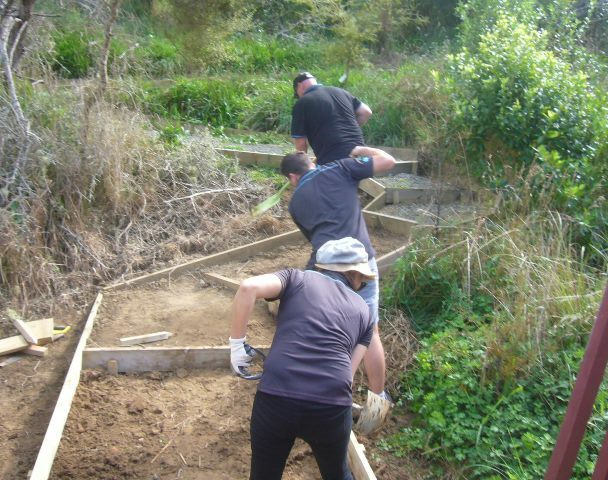 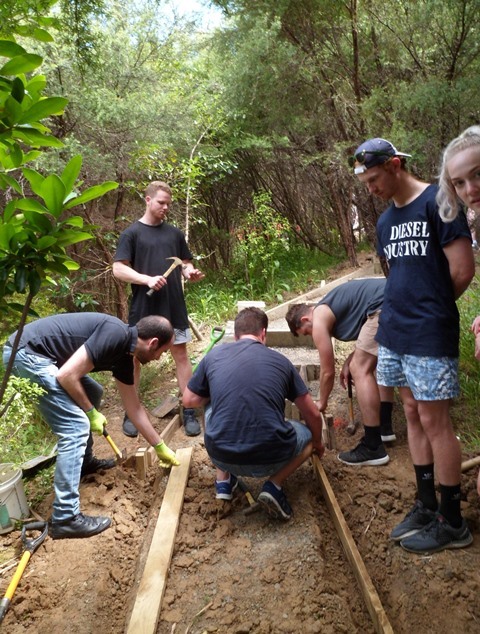 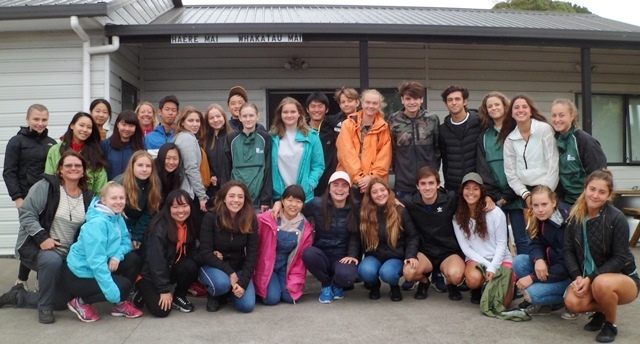 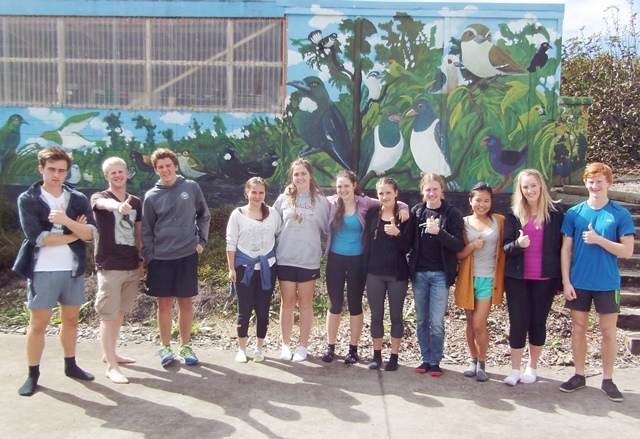 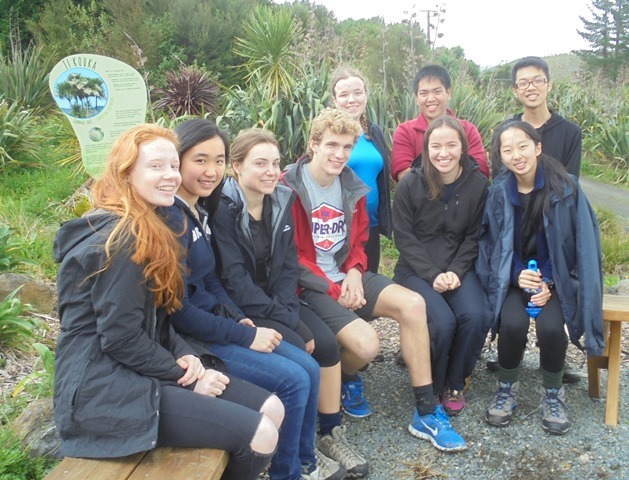 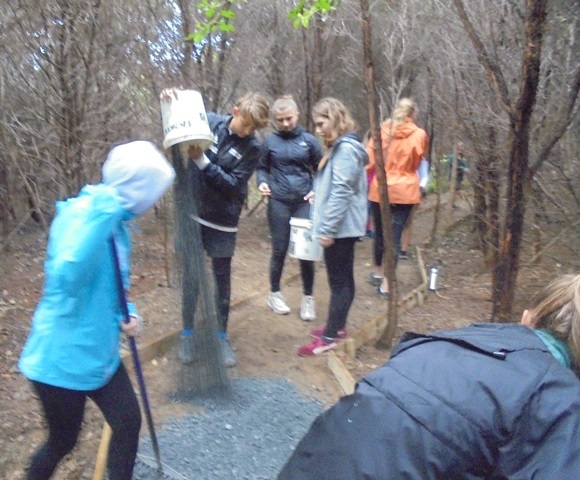 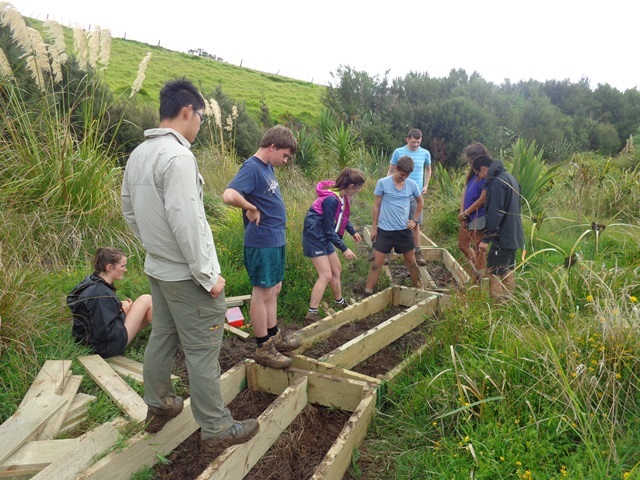 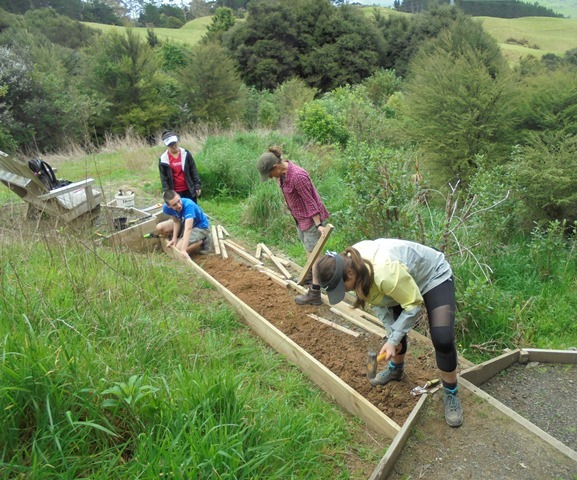 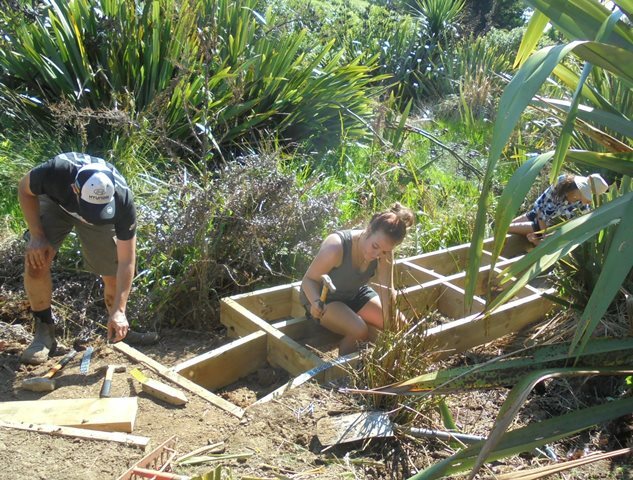 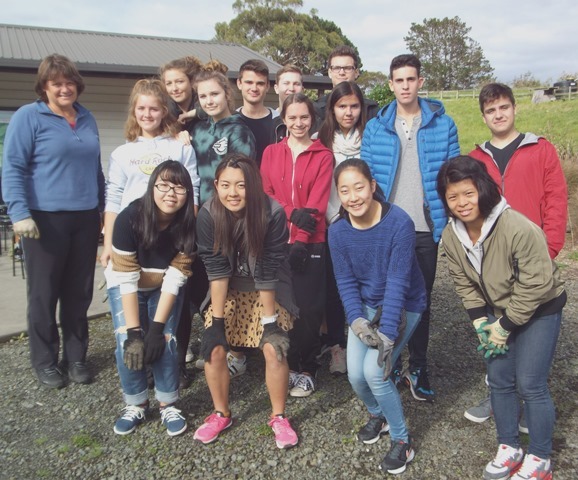 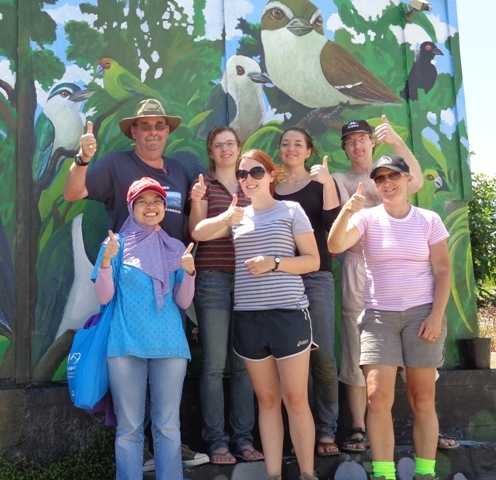 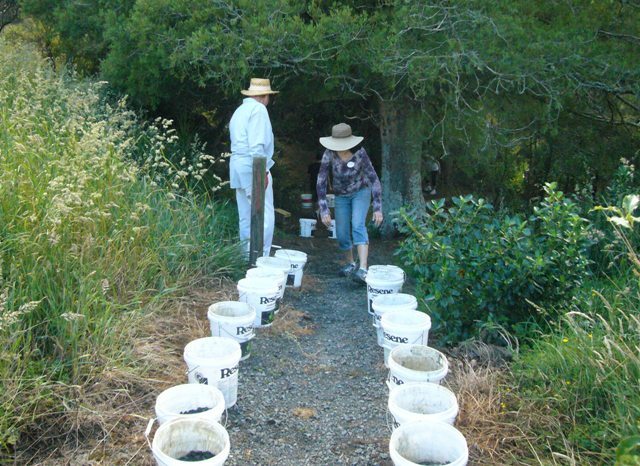 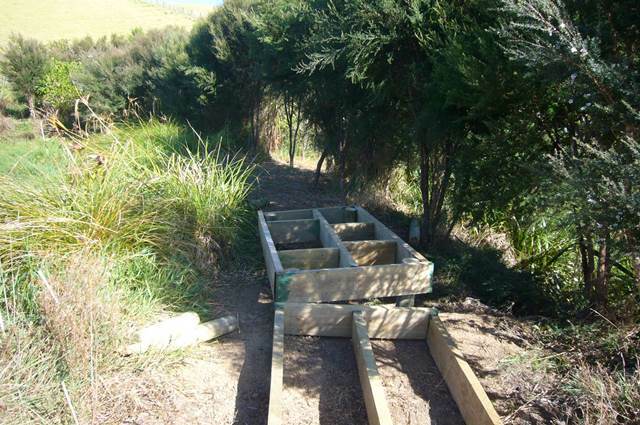 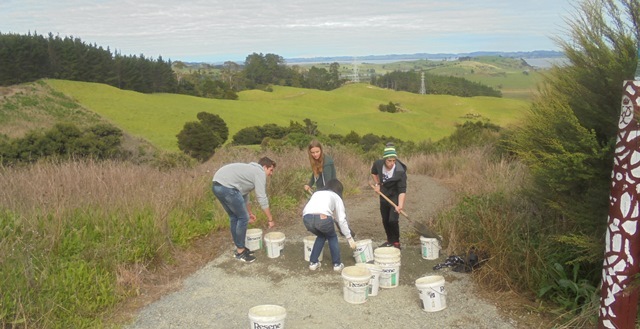 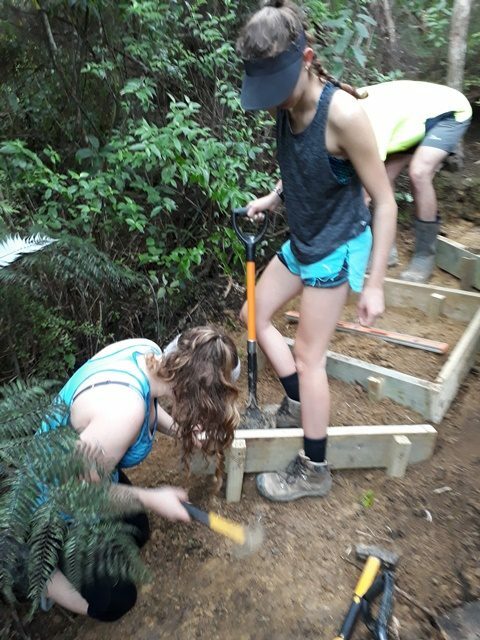 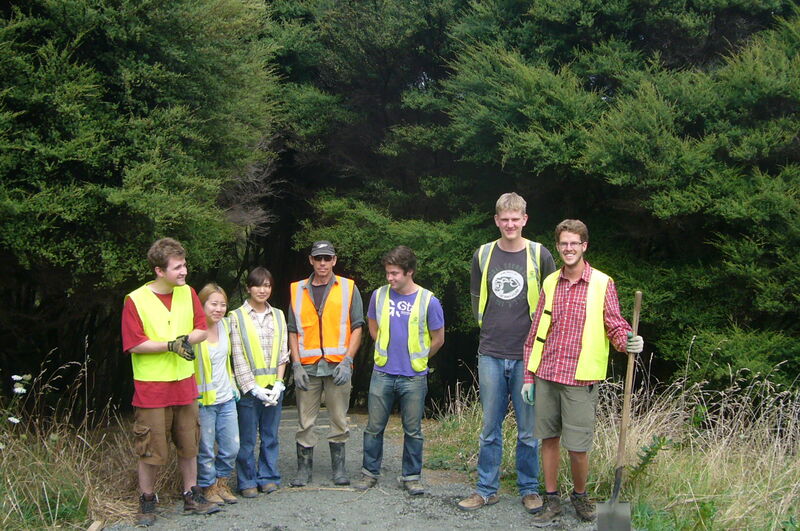 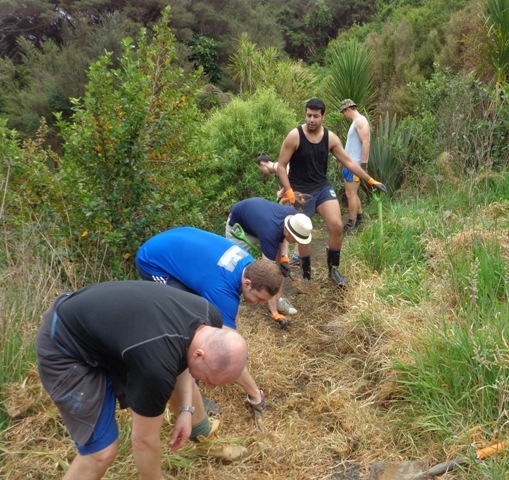 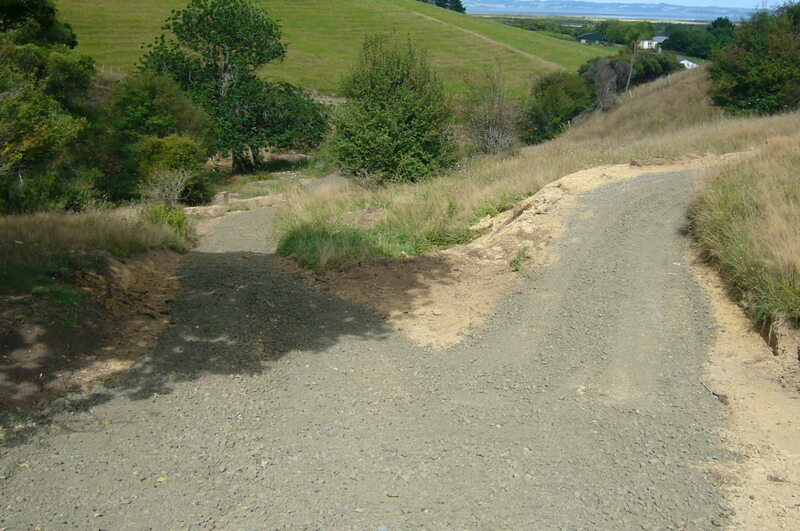 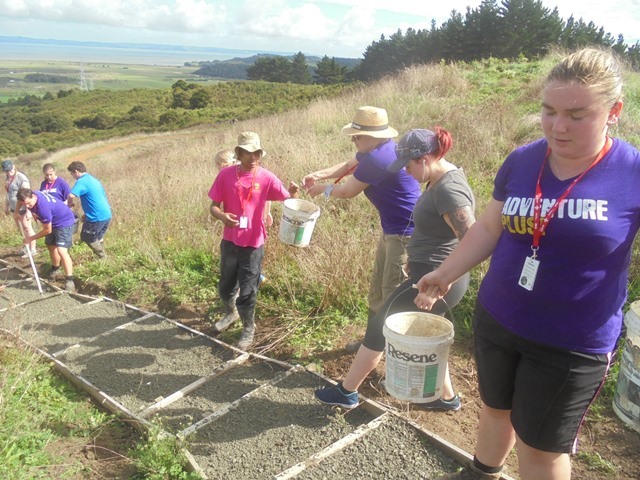 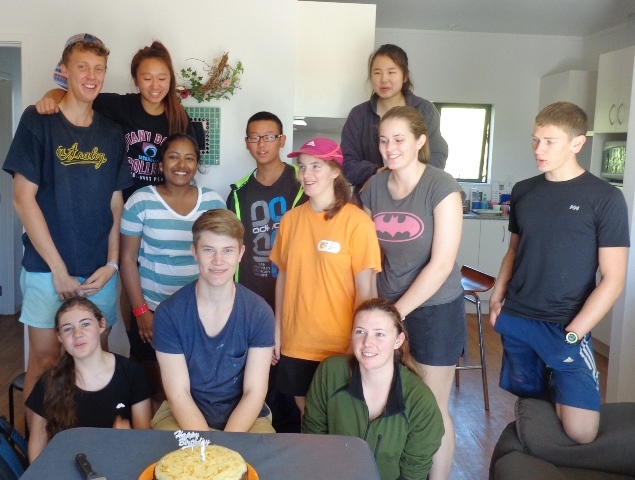 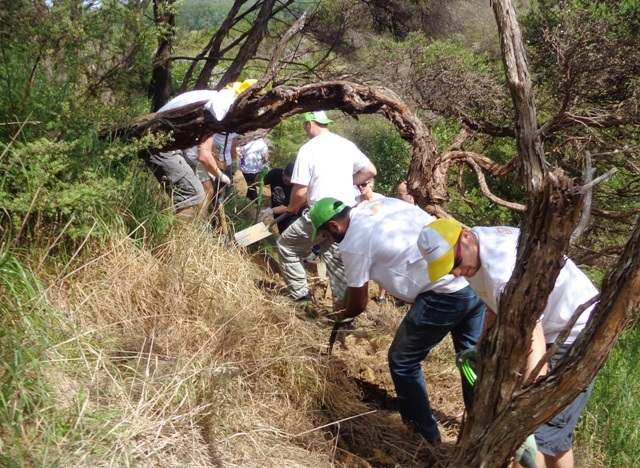 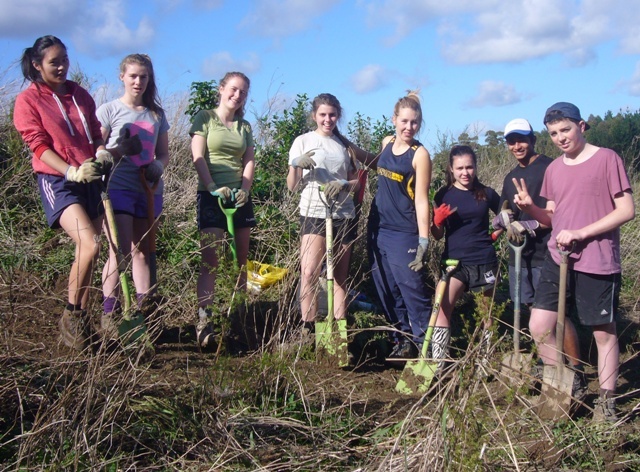 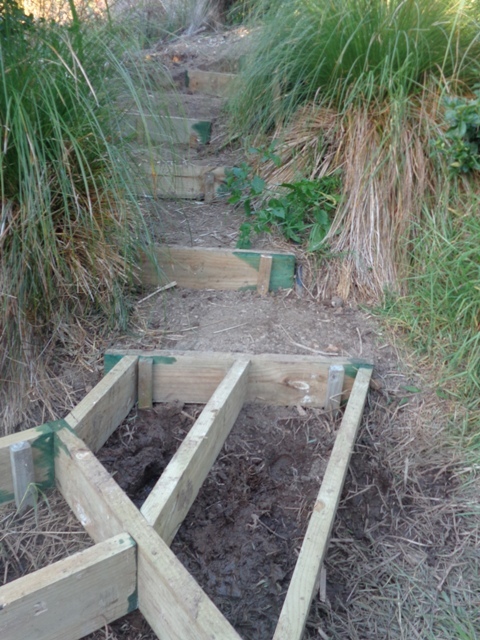 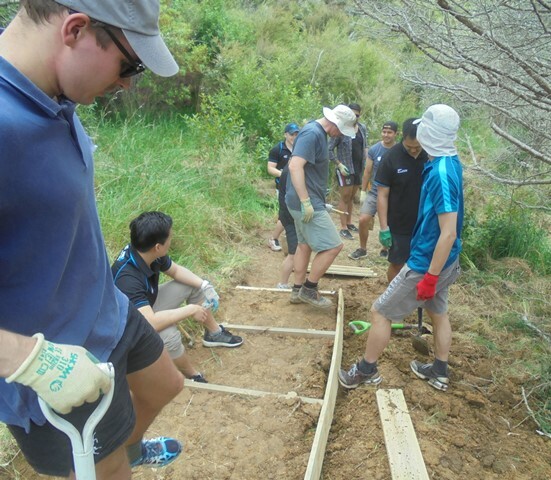 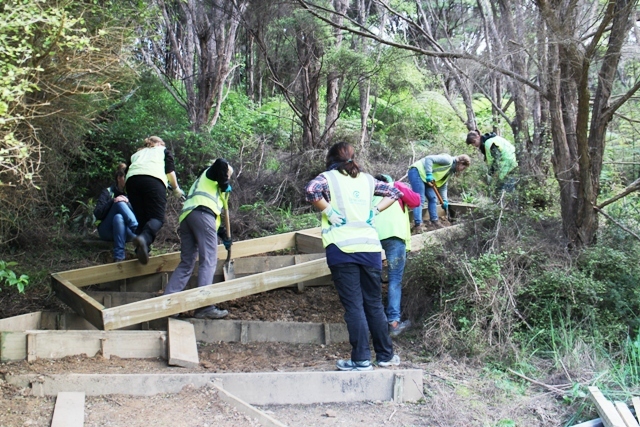 In 2012 we completed the main gully walking track and in 2013, Gold Award participants from the Duke of Edinburgh/Hillary Award programme have been putting in a track in the DofE/Hillary Grove. 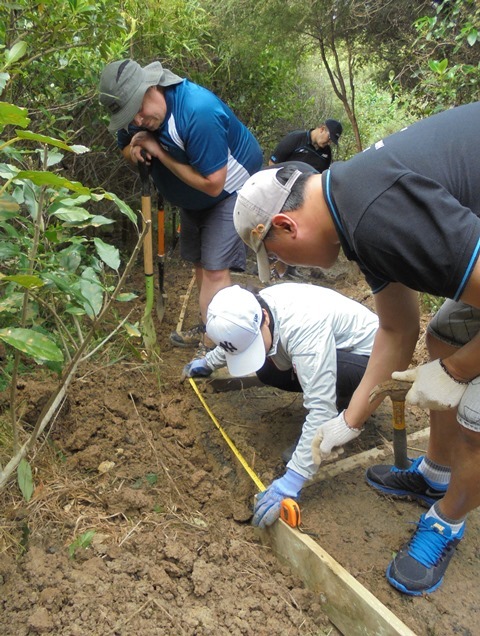 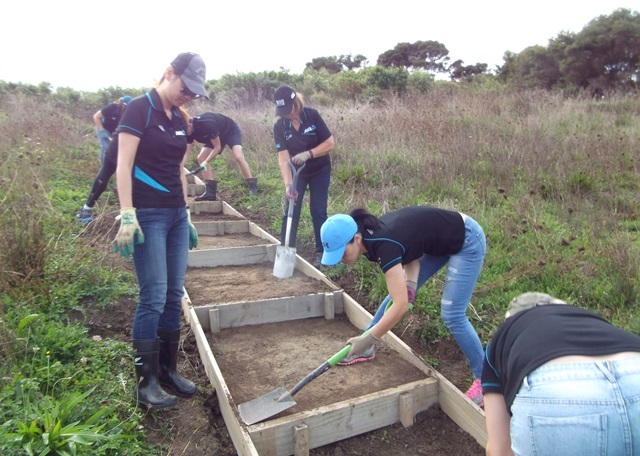 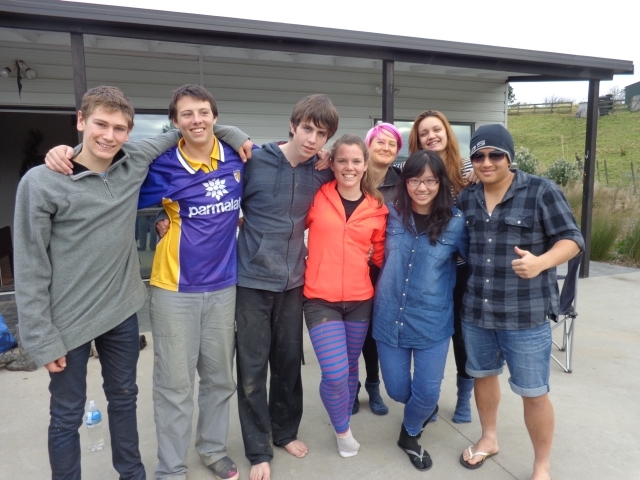 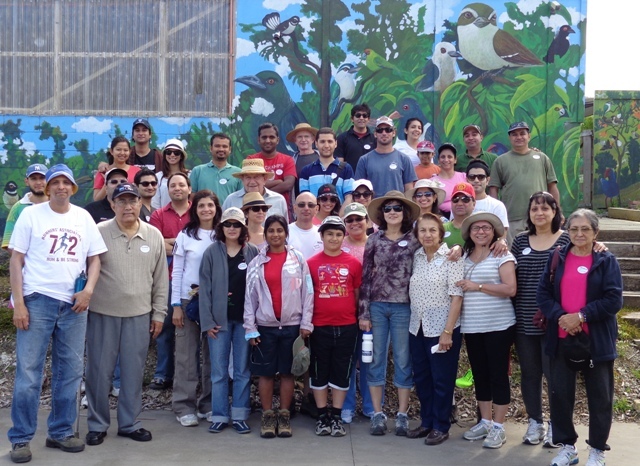 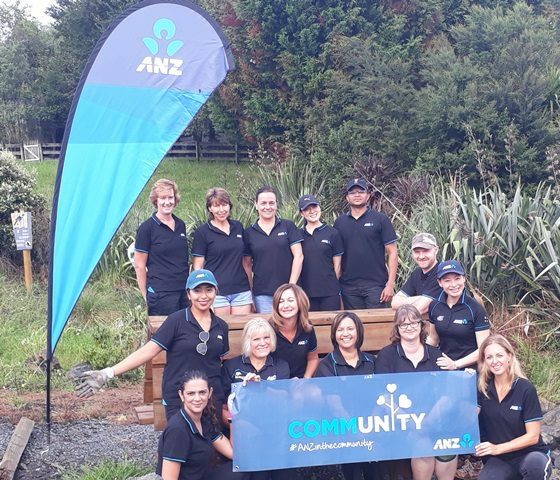 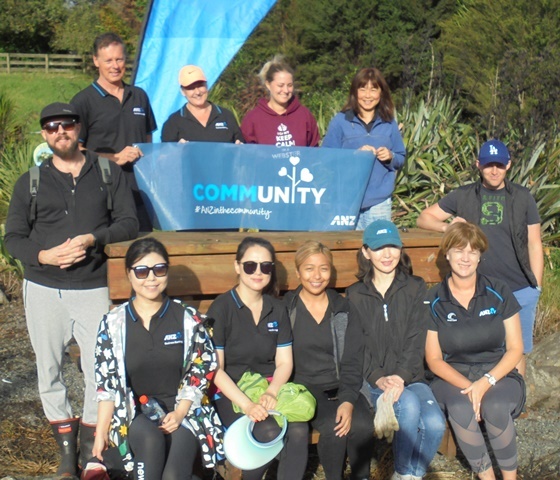 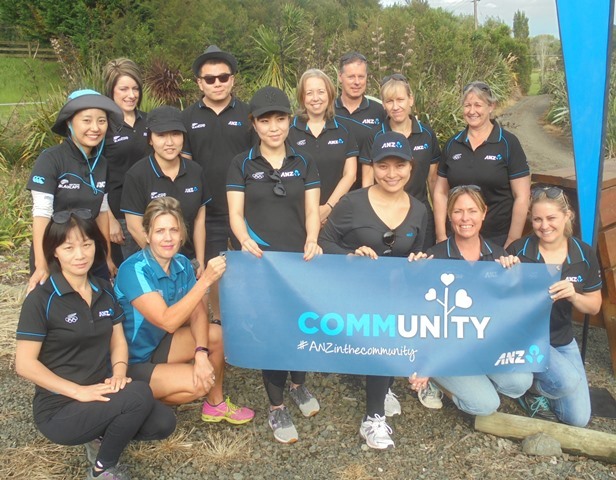 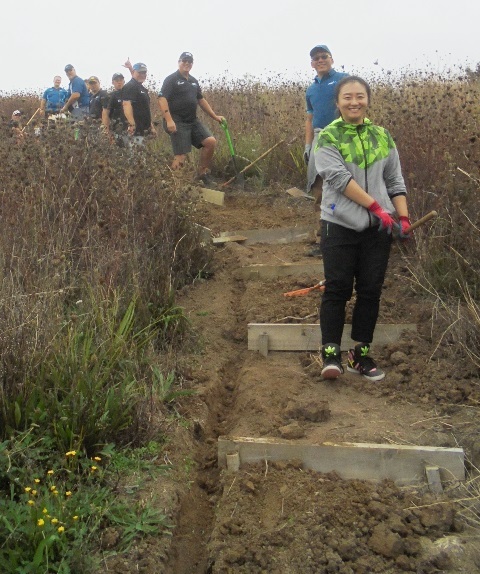 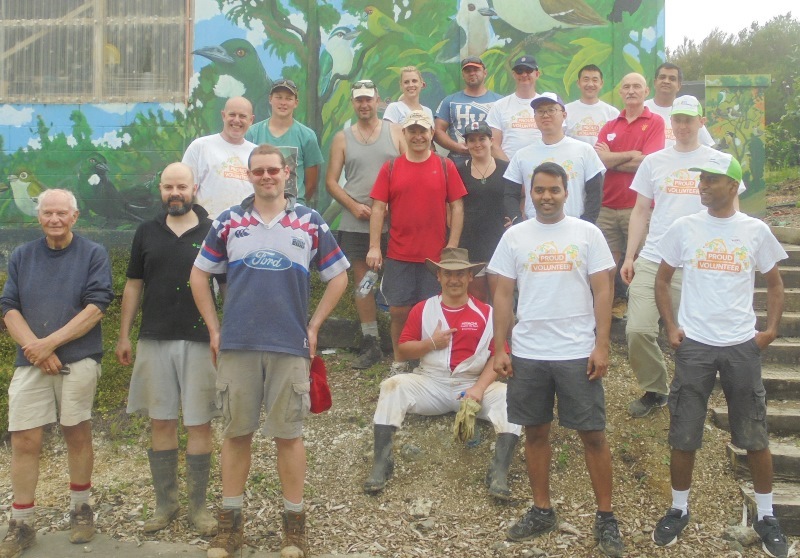 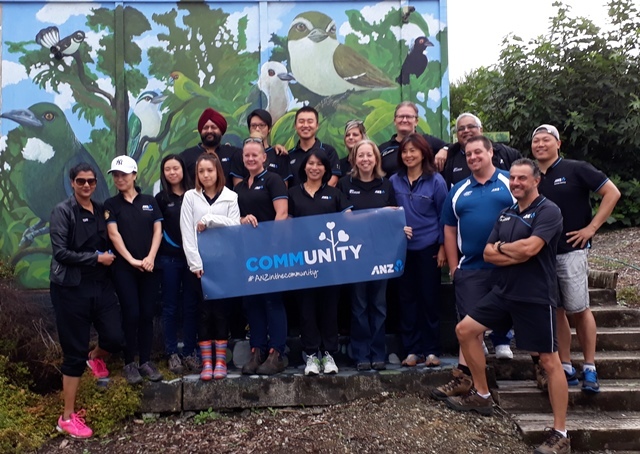 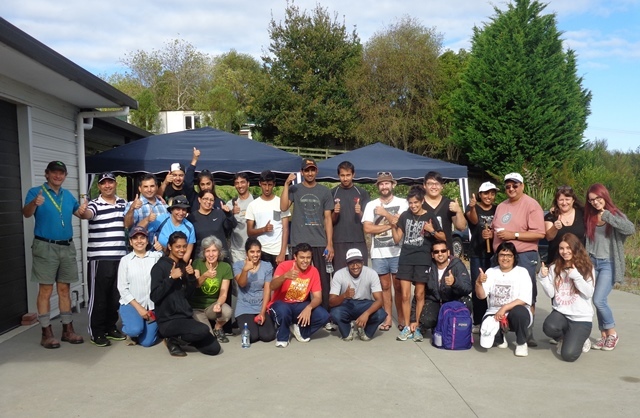 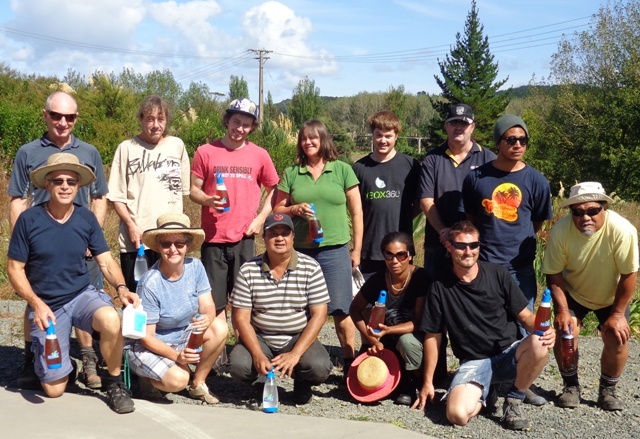 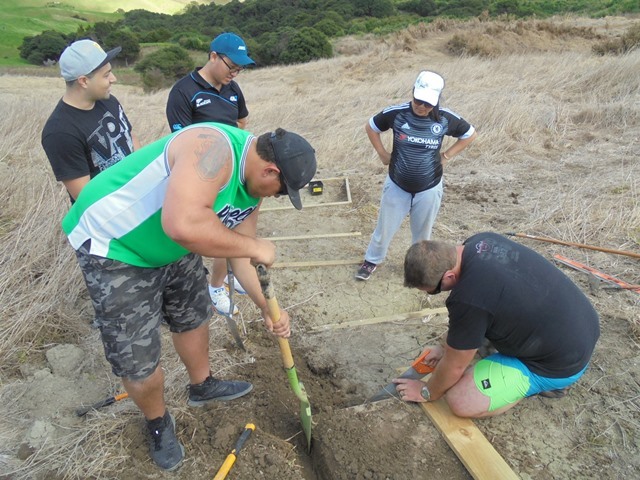 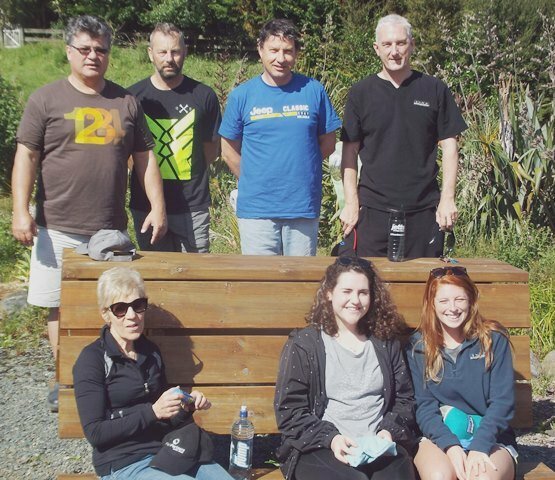 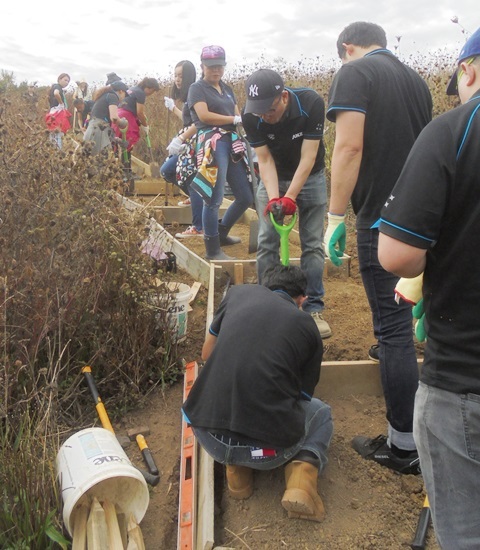 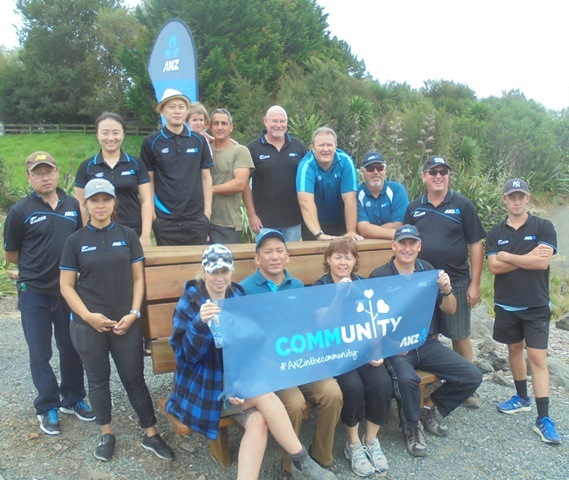 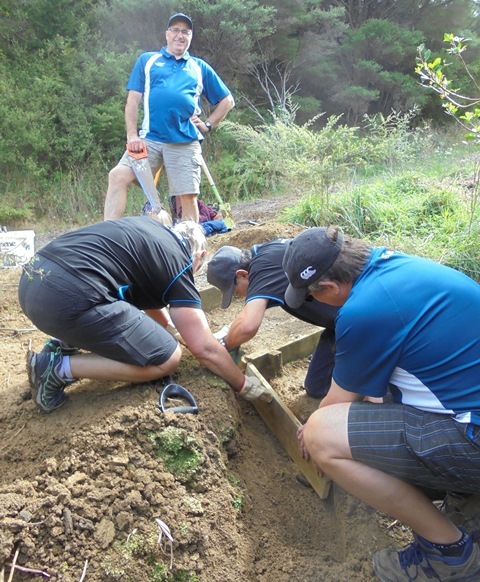 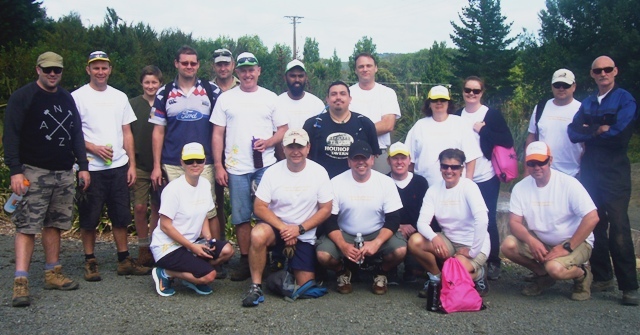 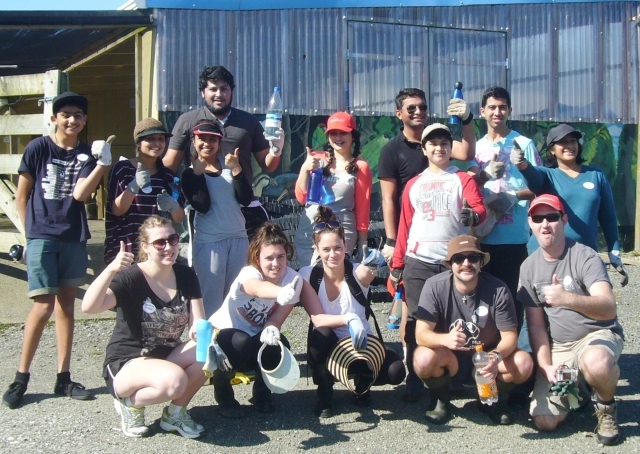 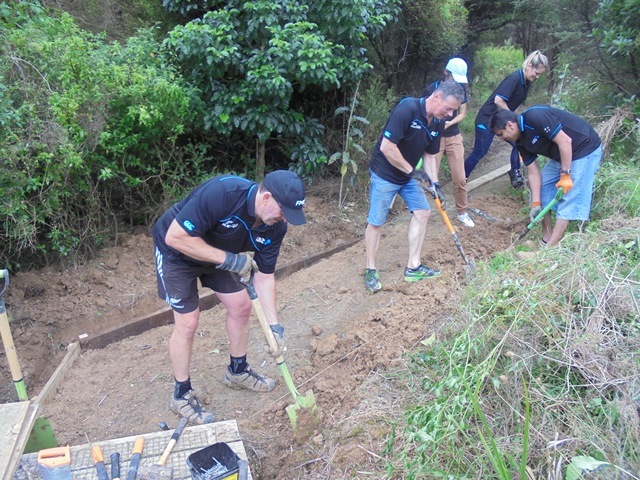 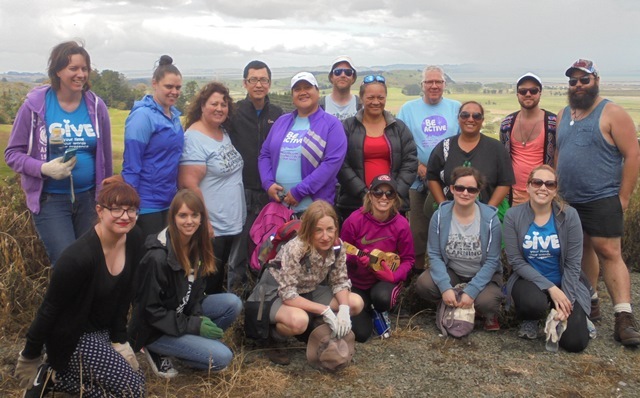 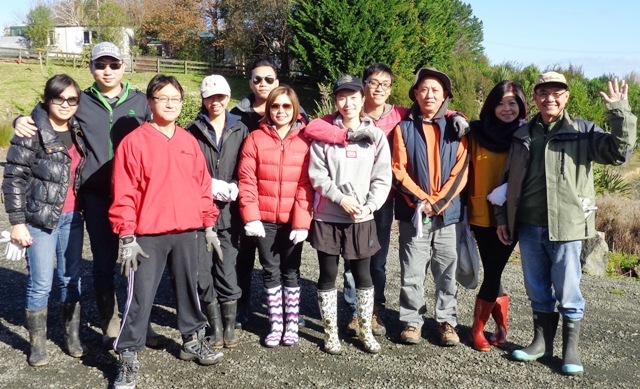 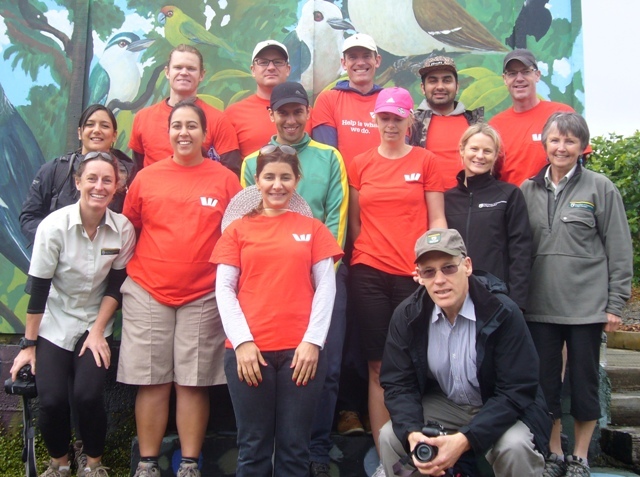 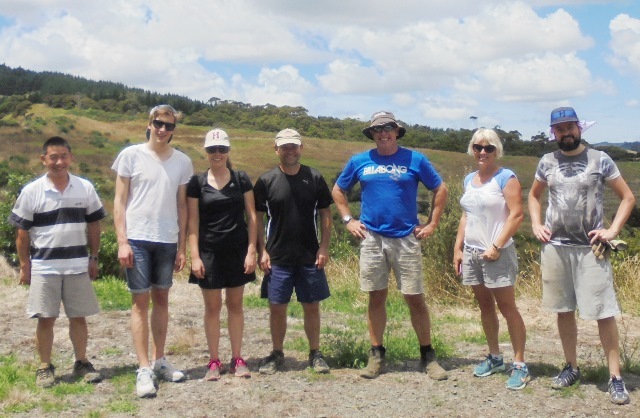 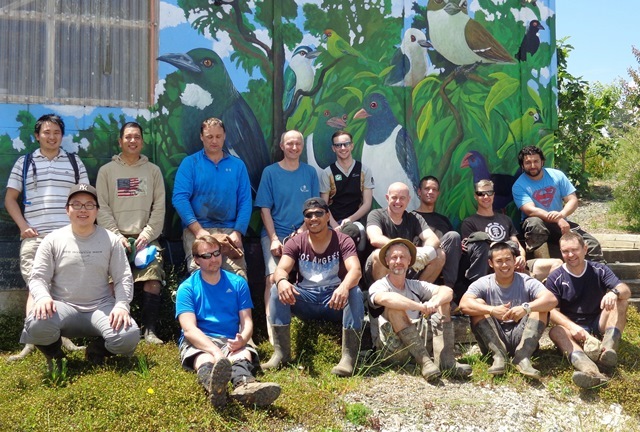 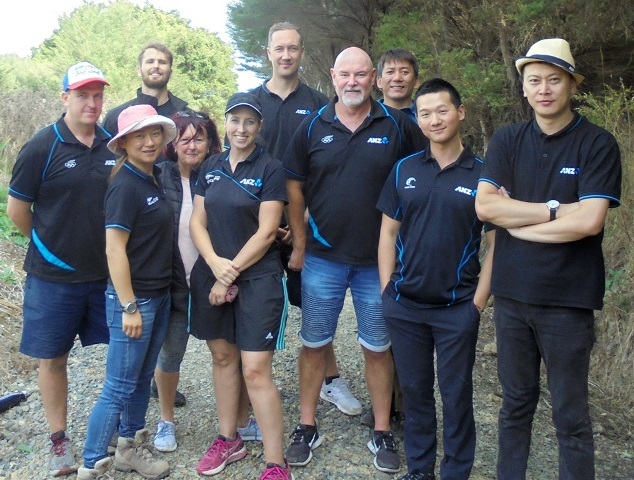 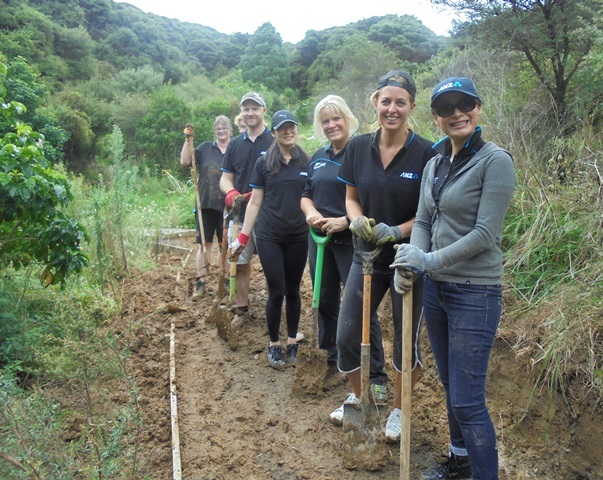 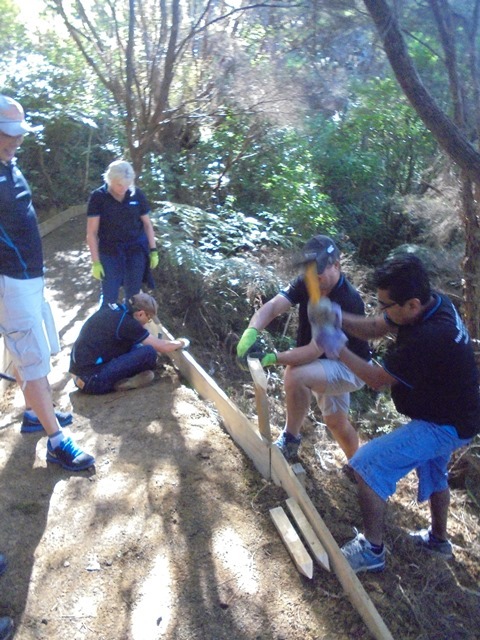 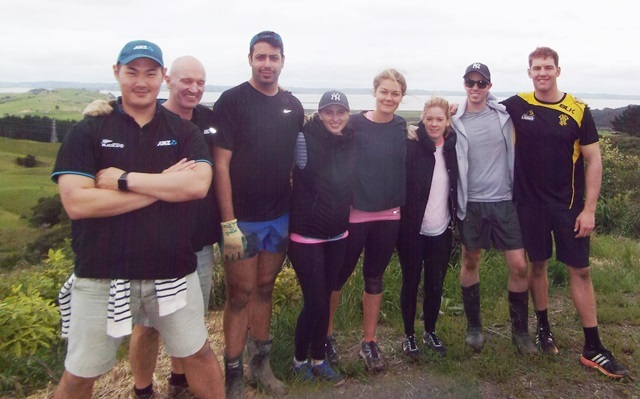 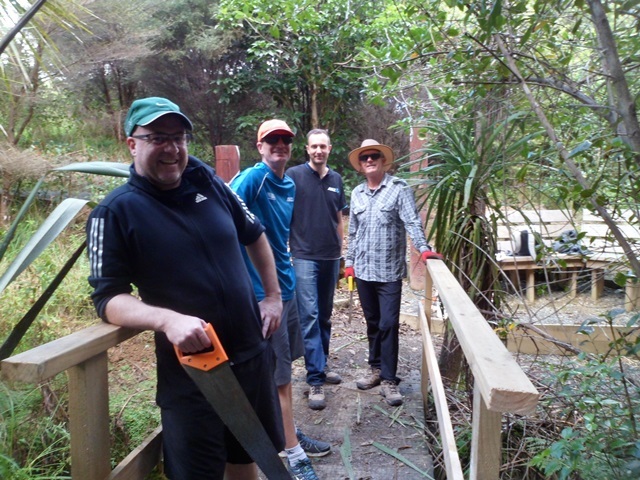 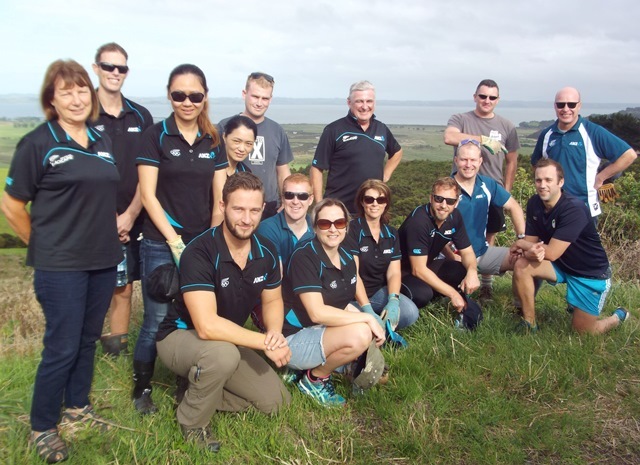 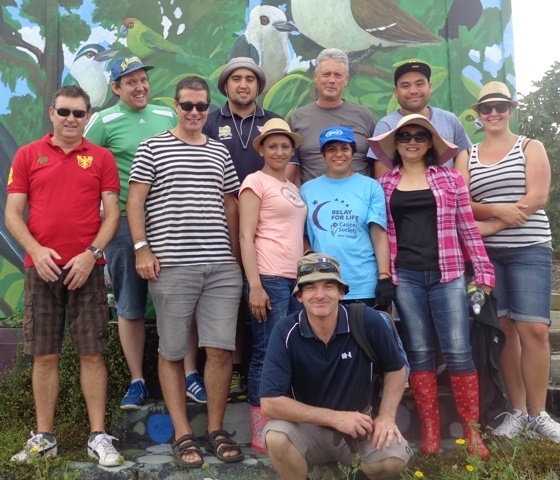 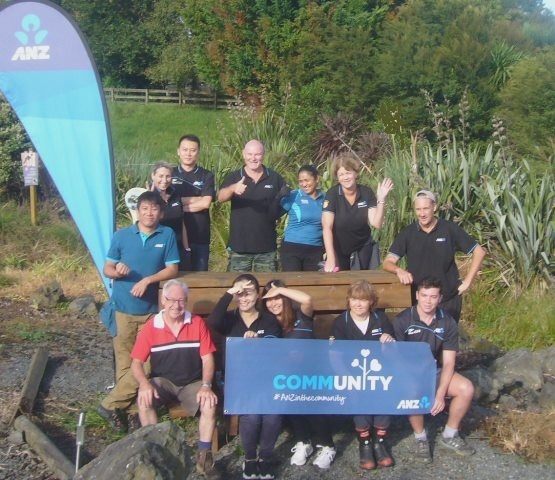 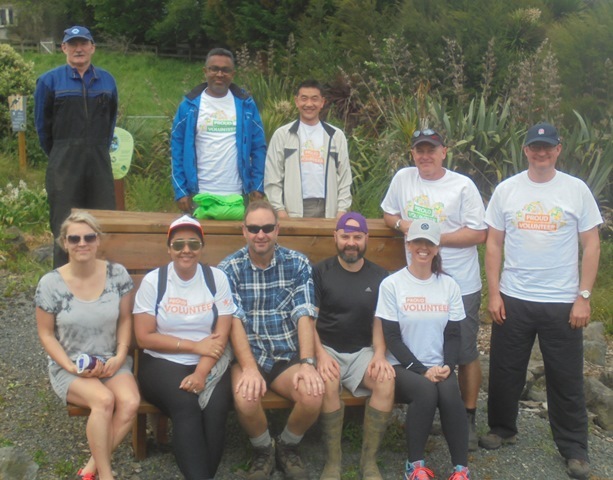 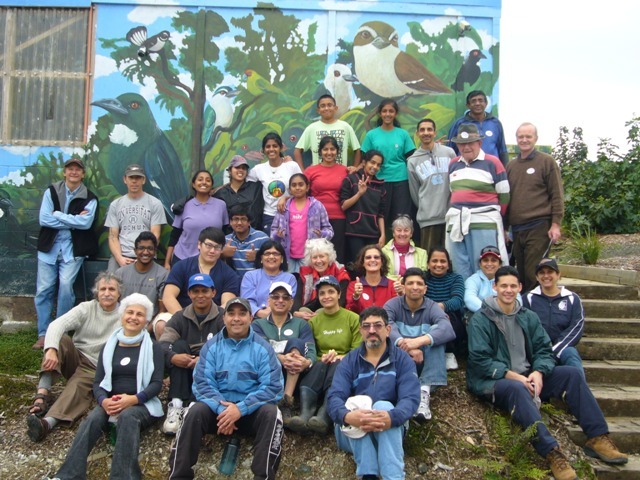 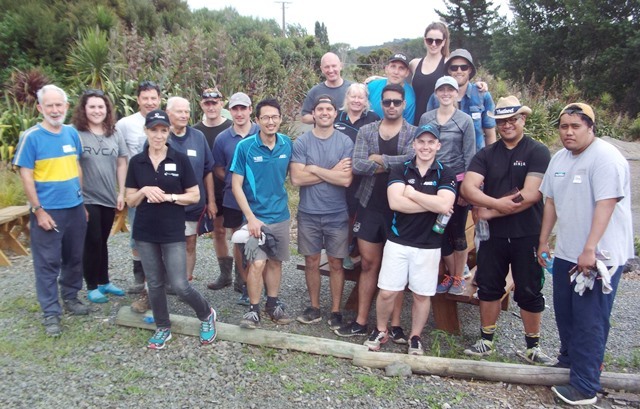 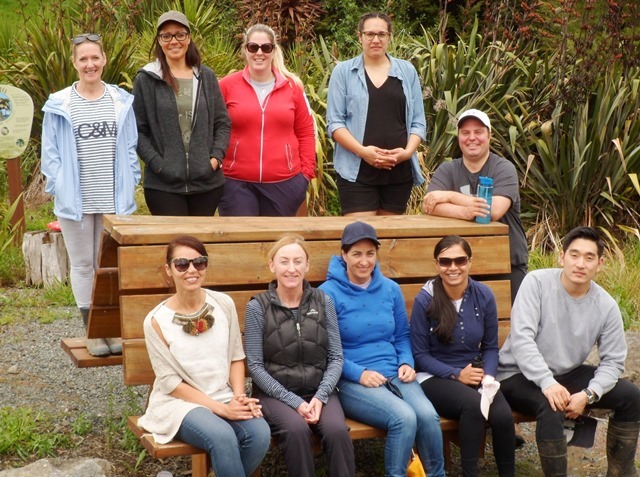 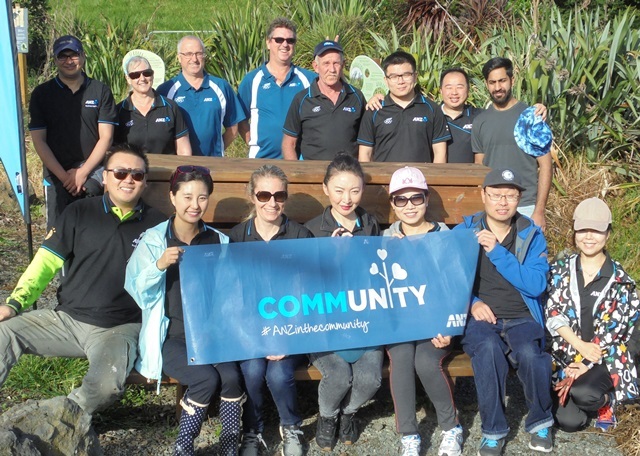 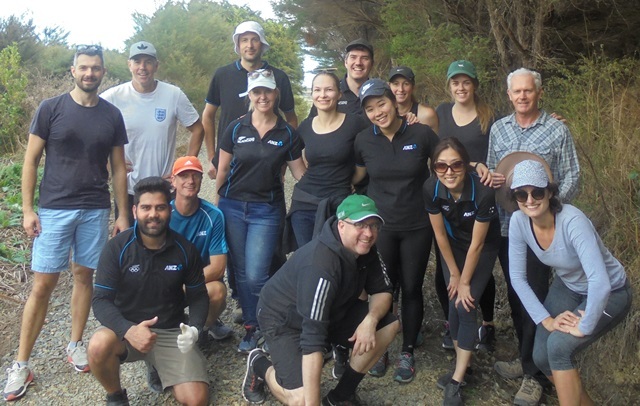 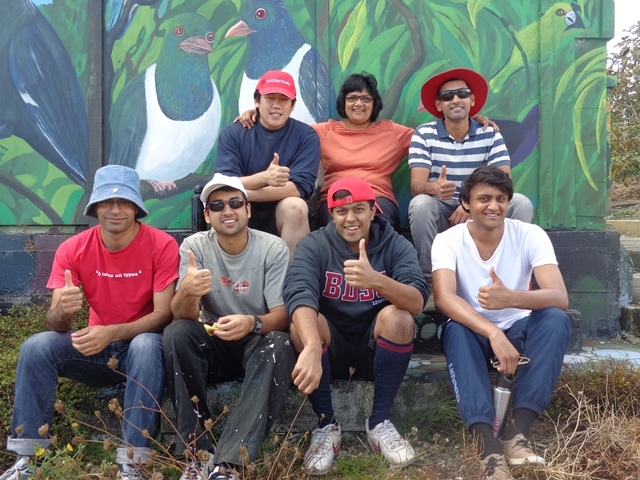 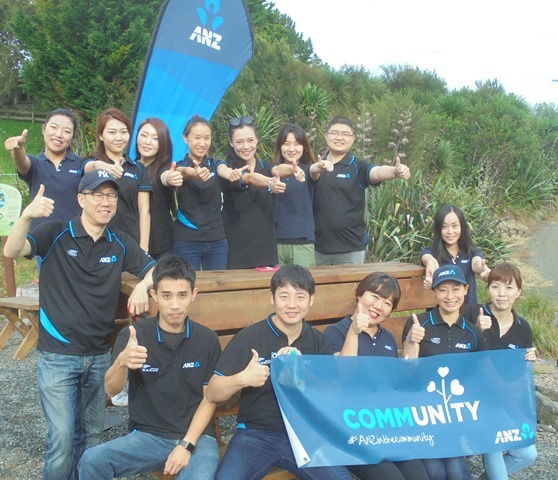 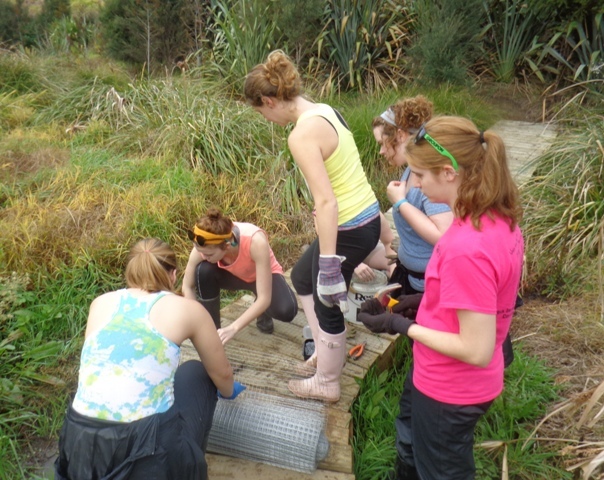 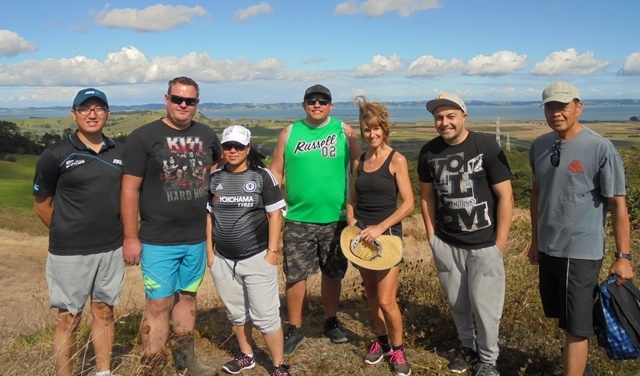 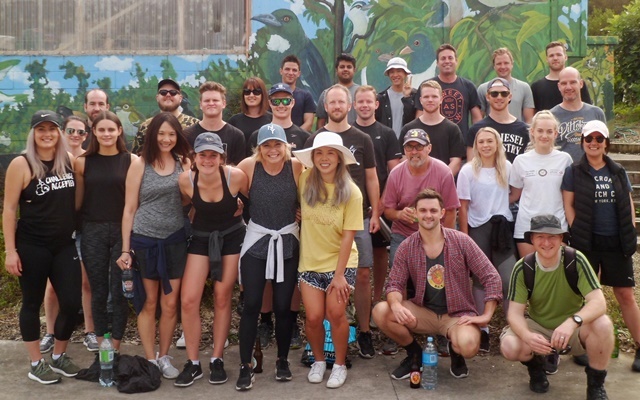 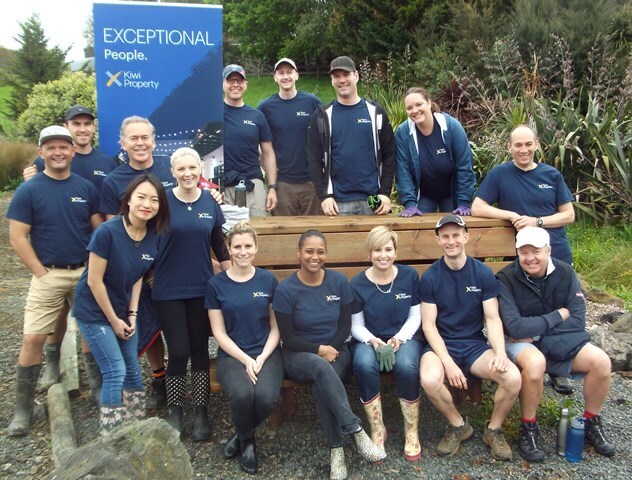 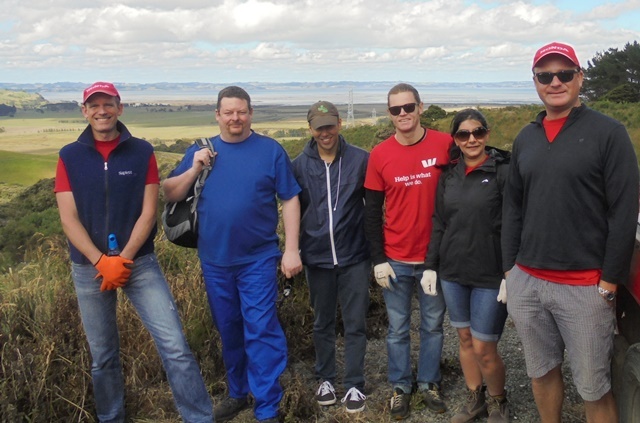 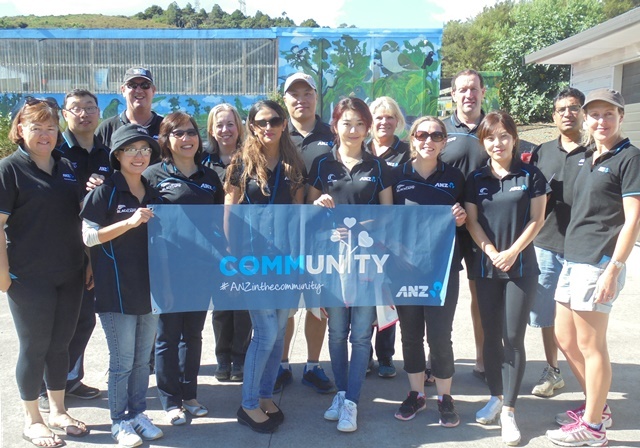 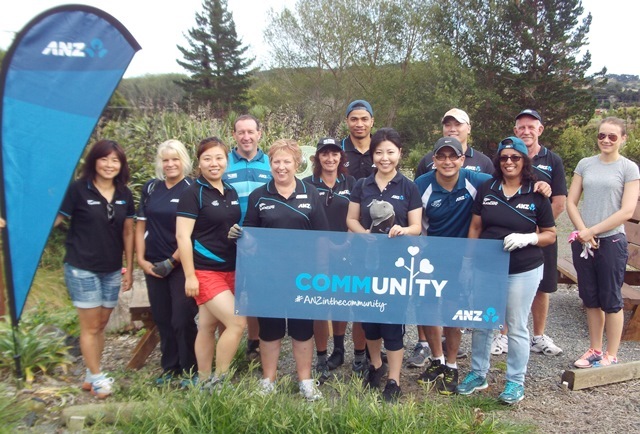 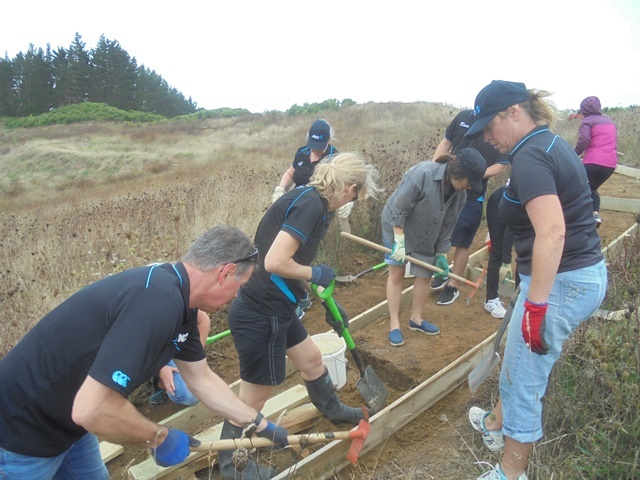 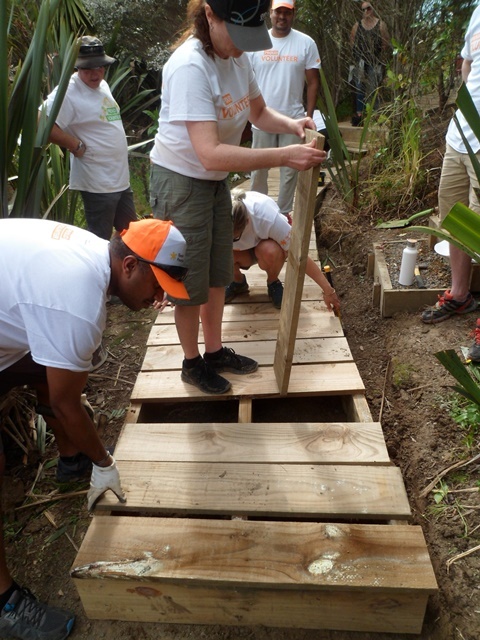 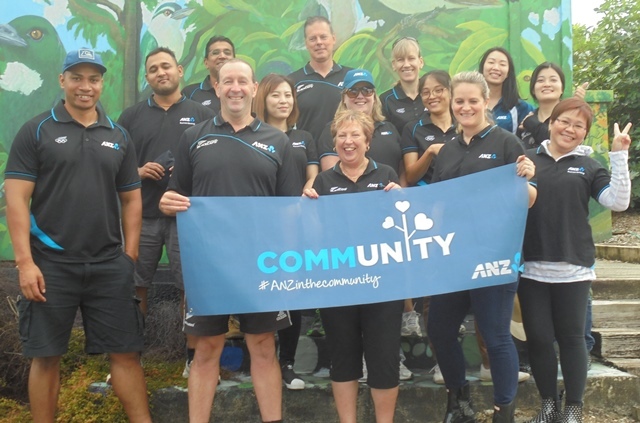 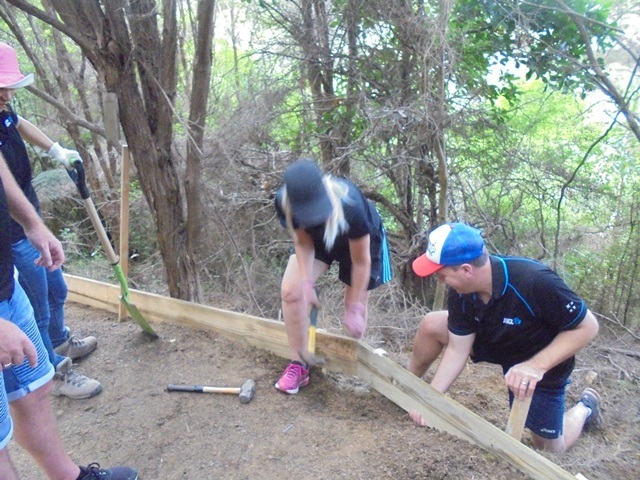 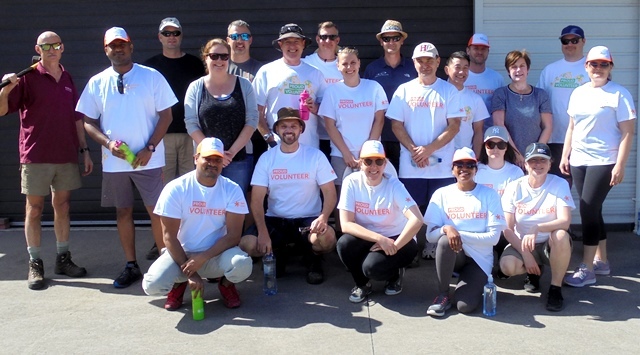 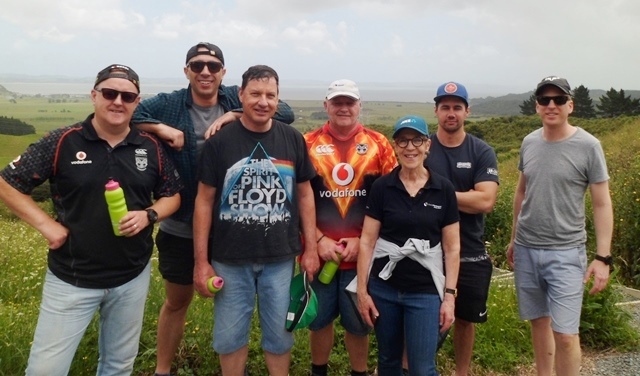 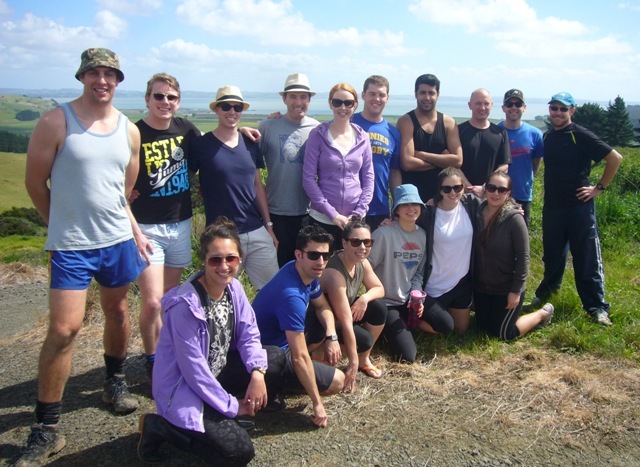 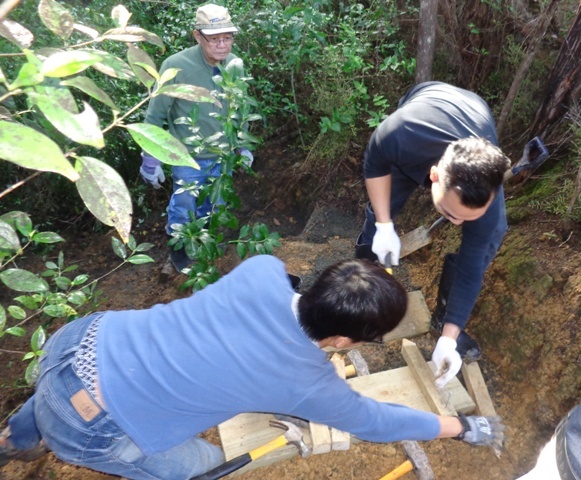 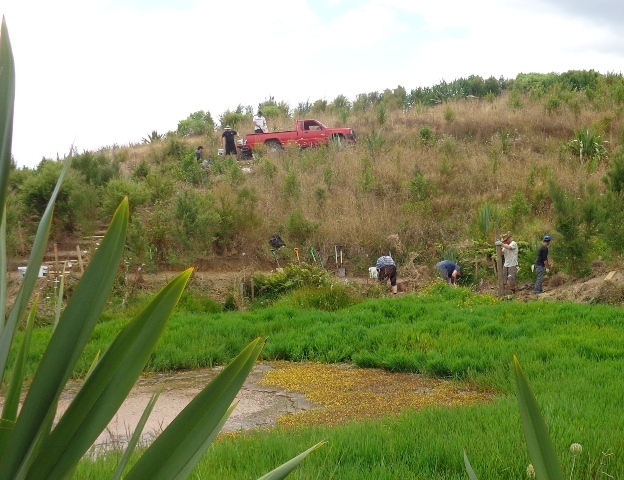 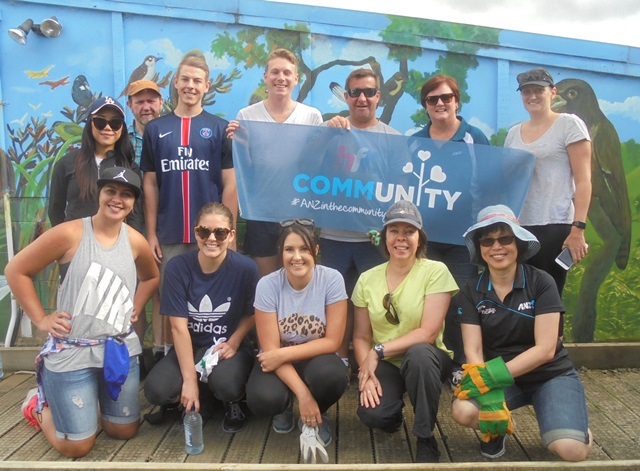 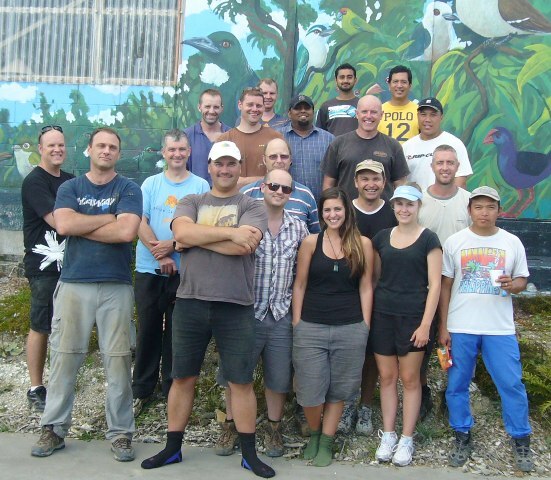 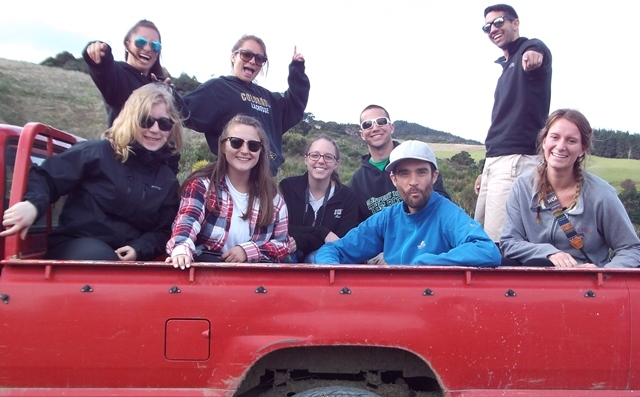 Teams from Gen-i/Telecom, Transpower and Northpower and VisionWest also built a track around one of the ponds in the wetlands. 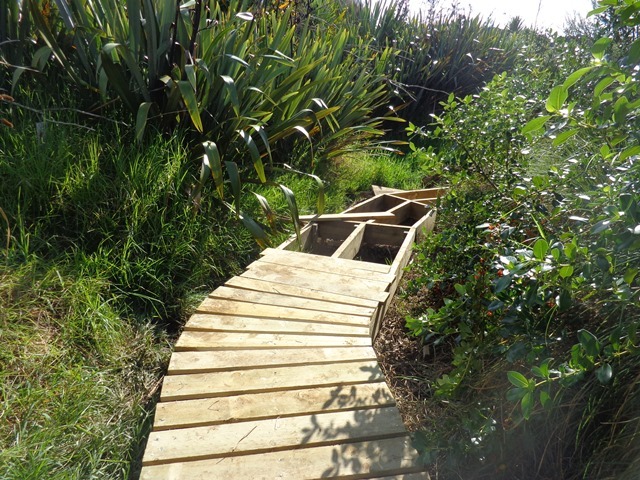 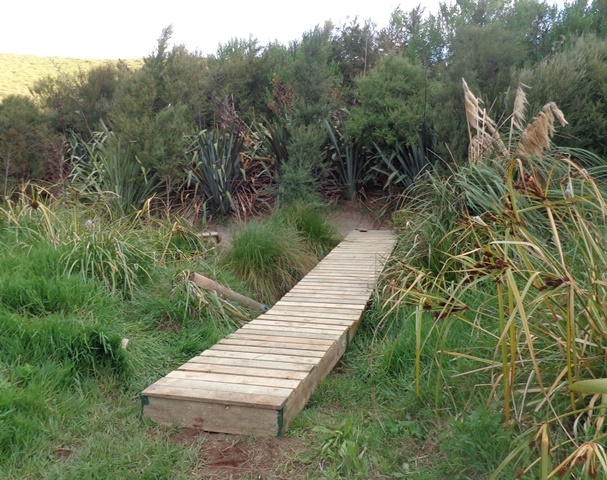 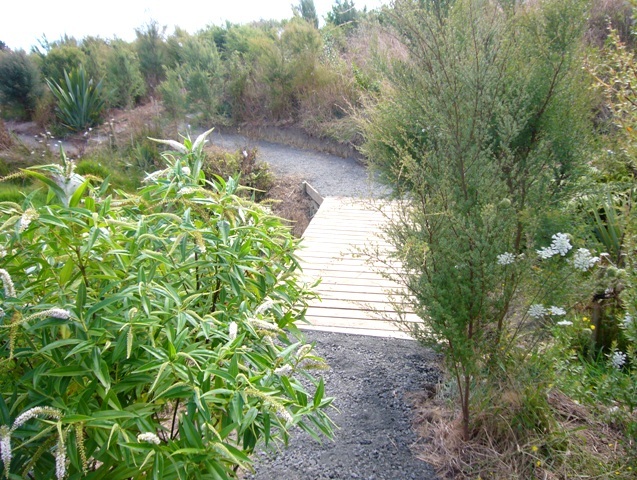 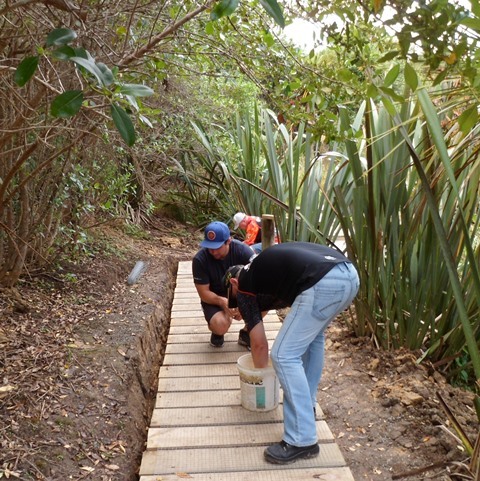 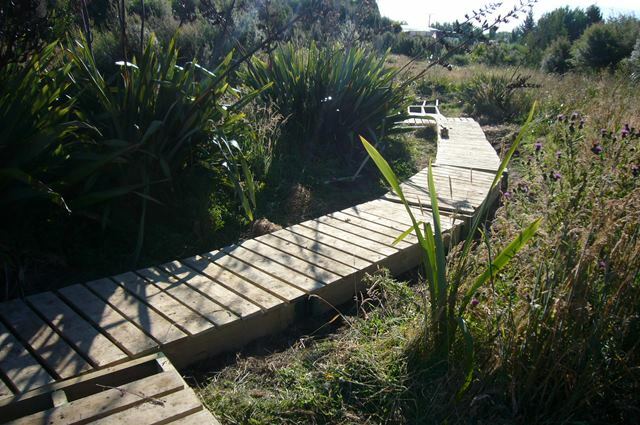 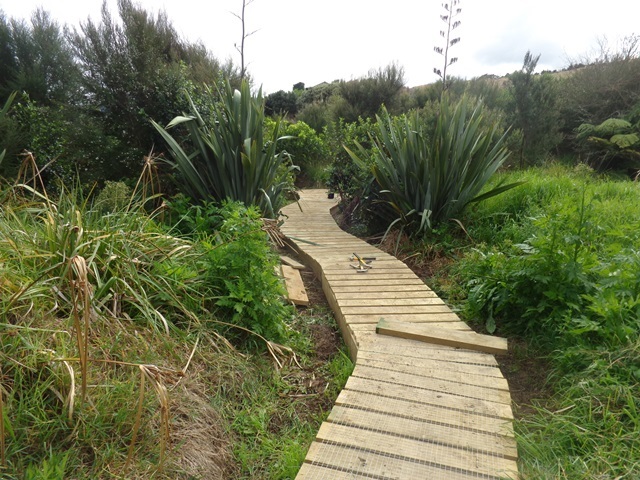 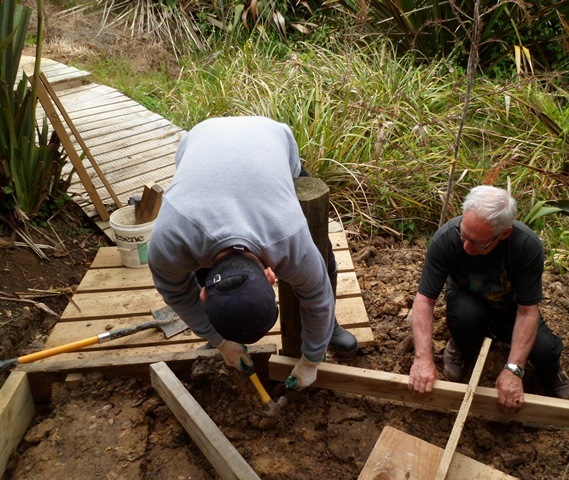 In late 2013 and early 2014 we built a boardwalk through the main wetland area so that visitors can enjoy that area of the property. 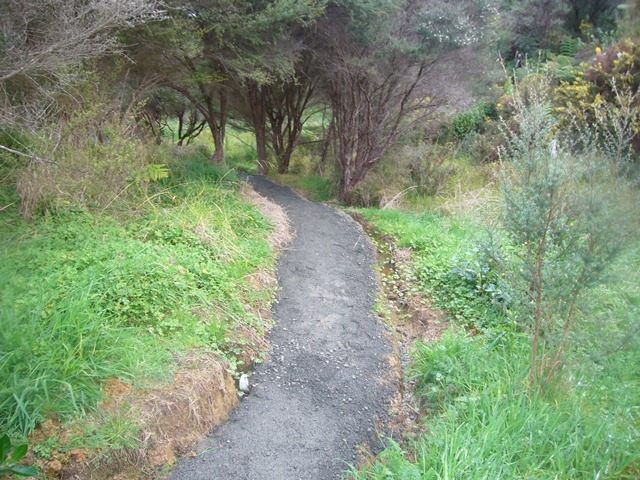 The walking track looks great!